Arif B. was just 15 years old in early 2011 when he left Afghanistan to travel to Indonesia by himself.He borrowed US$7,000 to pay smugglers to bring him to Jakarta. From there, he made his way to Banjarmasin, a town in South Kalimantan, and boarded another smuggler’s boat to take him on what he hoped would be his final destination: Australia. The crossing from Banjarmasin to the nearest Australian territory covers approximately 700 miles, and is perilous and often fatal, plied by unseaworthy vessels that lack sufficient navigation equipment, food, or fuel. Seven days into the 15-day journey, Arif’s boat went into distress. A passing cargo ship picked up the passengers, including Arif, and took them to the Indonesian police, who ignored the fact that Arif was a child traveling alone, half a world away from his parents. Immigration officials held the passengers overnight in an informal detention facility in Samarinda, East Kalimantan, before transferring them to the Balikpapan Immigration Detention Center (IDC), some 60 miles away. That day I was beaten up very roughly…. There were eight or nine people beating me, most were guards and there was one person from the outside. They hurt my shoulder, my ear, my back. I was beaten with one of the other people who was caught. It was in the courtyard, everyone was there.... They saw and watched. Including one family from Iran, with a seven-year-old boy. He was watching too. After 50 days, Arif was taken to Kalideres IDC near the capital Jakarta, one of Indonesia’s largest of the 12 or so IDCs nationwide. There, he bribed an immigration official with $400 to secure his release. We spent eight hours on the boat before it was in trouble, then three nights floating in the boat while it was sinking down.... For three days and nights, no water and food. We kept climbing higher and higher as the boat was sinking. After Arif was rescued, Indonesian authorities brought him back to Jakarta, and all but turned their back on him. Now 17, he lives in a shelter that a non-governmental organization (NGO) runs near Jakarta for unaccompanied migrant children. Although Arif has paperwork certifying that he is a refugee from the UN’s refugee agency, UNHCR, the Indonesian government does not recognize him as in the country legally. The government does not provide guardianship or other assistance to unaccompanied boys like Arif, and he cannot work legally, or move freely around the country. He hopes to be resettled to Australia, but in the meantime has no school to go to, and claims he still feels the psychological trauma of his flight, detention, and near-drowning. Despite his hardships, Arif is now one of the luckier ones: he has a place in a shelter and refugee status from UNHCR. Many other migrant children in Indonesia—both those traveling with parents or other guardians, and those traveling alone—are still detained, abused, and neglected. Each year, a growing number of asylum seekers—primarily from Afghanistan, Somalia, Sri Lanka, and Burma— enter Indonesia in search of safer lives. At the end of February 2013, there were 9,226 refugees and asylum seekers in UNHCR’s active caseload in Indonesia, a 2,000 percent increase since 2008. Almost 2,000 asylum-seeking and refugee children were in Indonesia as of March 2013.During the year 2012, 1,178 unaccompanied children entered Indonesia, the highest number in recent years.The real number of migrant children is likely to be far higher since many migrants and asylum seekers—including children—do not register with UNHCR, preferring to remain out of sight and try to make their way to Australia. While many migrants and asylum-seeking children, like Arif, may try to reach Australia, they often spend months or years caught in Indonesia. This report focuses on the thousands of children—accompanied and unaccompanied—who enter Indonesia every year, and it documents the abusive conditions and interminable waits children face during the months and years they spend in limbo in Indonesia. Indonesian law permits immigration detention for up to 10 years without judicial review. As a result, many children remain in detention for years, facing an array of abuses including physical violence from immigration officials, bribery and confiscation of property, and lack of basic necessities. The impact of prolonged, indefinite immigration detention is particularly severe for children, many of whom experience post-traumatic stress disorder or depression. There were 20 or 30 unaccompanied minors… Whenever the boys talked on the phone with their families, they would cry. The boys cried all the time. They were the most powerless in there. They would get attacked. Three shifts of guards, they would each come with sticks and knives and hit us. Six or seven guards would come and beat us for fun. It lasted for three days, every day, all day. They did it for fun. One friend of mine … had a broken arm. My face was black and blue. My kidney was damaged for a month—it was bad—from the beating. Several unaccompanied boys told Human Rights Watch that Indonesian immigration guards beat them in detention. In another case, parents said immigration guards forced their children, including their four year old and six year old, to watch guards beat other migrants. The ill-treatment can be fatal. In February 2012, Taqi Naroye, a 28-year-old Afghan asylum seeker was beaten to death in Pontianak IDC after attempting to escape. Police had returned him to the facility in good health. The next day, he was delivered, dead, to the local hospital. According to our interviews, other migrants witnessed his beating, including one unaccompanied migrant child who was then beaten himself. Accountability for abuses is generally lacking. Apart from some minor changes at Pontianak, there has been little accountability for Naroye’s death. There has been no nationwide review of physical abuse in detention, and there are no comprehensive procedures in place to train immigration staff or provide a complaints mechanism for detainees. Nor does the immigration detention system have published regulations establishing clear consequences for violations of detainees’ rights. Despite the growing numbers of migrant children, Indonesia fails to respond to their needs. It does not provide access to asylum for migrant children or their families and leaves unaccompanied migrant children alone, unprotected, and without access to services. Indonesia has not ratified the 1951 Refugee Convention or its Protocol, and does not have adequate domestic asylum laws. As a result, processing asylum applications falls to UNHCR, which provides certificates recognizing individuals and families as refugees. Yet UNHCR’s process comes with many delays, leaving hundreds of migrant children in detention, and these certificates carry little official weight with the Indonesian government. 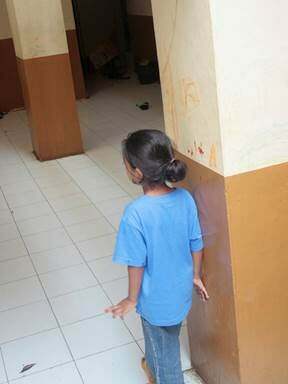 Indonesia does nothing to assist unaccompanied children, some of the most vulnerable asylum seekers. Though Indonesia is obliged, due to its ratification of the UN Convention on the Rights of the Child, to provide unaccompanied children with guardians, it has neglected to assign that role to any government entity. Without guardianship, some children remain in detention, unable to be released without anyone to care for them. Outside detention, only a handful of unaccompanied children, like Arif, have any assistance. There are places in shelters for perhaps 140 children at any time. Others still live on the street or in crowded private accommodation with other migrants, at risk of exploitation, destitution, and re-arrest. None receives the care to which they are entitled by law from the Indonesian government. Even with recognition from UNHCR, migrant children—whether accompanied or unaccompanied—have no viable future in Indonesia. They have no legal status under Indonesian law, cannot work, and have limited access to education. Constantly vulnerable to arrest or rearrest for violating these or other rules, refugees are reluctant to seek police protection should they become victims of crimes. Only a small minority (just 247 people in 2012) are resettled to third countries. Indonesia bears primary responsibility for its appalling treatment of migrants, asylum seekers, and refugees. However, Australia has pursued a strategy of immigration enforcement first, refugee protection second which leave migrants with few options other than to risk boat journeys. It has assisted the Indonesian government in constructing new immigration detention facilities, and Australia supports UNHCR and IOM operations in Indonesia, including some inside the detention centers. In August 2012, Australia reinstated the much-denounced “Pacific Solution,” which sends migrants to offshore facilities in Nauru and Manus Island, Papua New Guinea, for processing of their asylum claims, which should be heard in Australia itself. Australia claims that such measures help to deter irregular boat migration, yet in the months after the Pacific Solution was reinstated, significant numbers of boats continued to arrive in Australian territory. While Australia and Indonesia do have the right to control irregular immigration into their countries, they must do so in a way that respects children’s rights and provides protection for some of the most vulnerable new arrivals. Both Australia and Indonesia should prioritize children’s rights above immigration enforcement, so that children receive appropriate protection and care. Children like Arif B., who show great courage and resilience in journeying far from home, deserve the chance to have a meaningful future. Immediately review all immigration detention policies, end guards’ physical abuse of detainees, and improve the appalling conditions of detention. Immediately release all unaccompanied migrant children, and actively explore alternatives to detention for children. Ensure that, in the rare occasions where children are detained, that conditions are suitable, that children are not held with unrelated adults, and that they have access to education. Ensure that unaccompanied migrant children are granted guardians, legal assistance, and assistance with their basic needs. Ratify the 1951 Refugee Convention and implement a fair, humane, and speedy asylum system. Take wide-reaching measures to respond to the needs of asylum seekers and refugees throughout the asylum process, including providing viable options for life in Indonesia. End aggressive attempts to deter irregular migrants from reaching Australian territory. Demand that Indonesia live up to minimum human rights standards before providing funding to detain irregular migrants. Take advantage of opportunities to ensure a meaningful life for refugees awaiting resettlement in Indonesia, including through funding access to education, as one measure in deterring boat migration. Human Rights Watch carried out research for this report in Indonesia in August and September 2012. Two researchers interviewed 102 migrants between the ages of 5 and 66, including 36 women and girls. Forty-two of our interviewees were, according to their own accounts or those of their parents, children when they entered Indonesia. Thirty-eight were still children when we interviewed them. Eleven were unaccompanied (without a parent or guardian) when they entered the country. We interviewed the parents of six children below the age of five years to understand the experiences of very young migrant children. 43 percent of our interviewees were from Sri Lanka (most of whom were Tamil); 26 percent were from Afghanistan (many of whom were Hazara); 17 percent from Burma (mostly Rohingya); and 7 percent from Somalia. The other interviewees were Nepali, and people born in Iran of Afghan descent. According to our interviews with officials from government, intergovernmental organizations, and NGOs, there are also asylum seekers in Indonesia from Iraq, Iran, Libya, Pakistan (including people born in Pakistan of Afghan descent), China, Russia, and various African countries. We conducted some interviews in English and Nepali, and other interviews with the help of interpreters in a language in which the migrant was comfortable (such as Pashto, Dari, or Tamil). We interviewed migrants and asylum seekers in areas near residential facilities in Medan, Bogor, and elsewhere, as well as in detention facilities. We explained to all interviewees the nature of our research and our intentions concerning the information gathered through our interviews, and we obtained verbal consent from each interviewee. No interviewee received financial or other compensation in return for interviewing with us. Most interviews were conducted individually and privately; this included extensive, detailed conversations with released detainees. In addition, Human Rights Watch researchers visited several immigration detention facilities and conducted group interviews with detainees (the number of participants ranged from 2 to 12). In order to safeguard interviewees who were detained at the time of our interviews, our conversations took place outside the hearing of immigration staff. Human Rights Watch researchers met a number of government officials concerned with migration, who worked for the police, Imigrasi (directorate general of immigration), and the Ministry of Social Affairs. We also sent letters requesting data and other information concerning immigration and detention in Indonesia on December 21, 2012, and again on March 5, 2013, to the chief of national police, the minister of law and human rights, and the ambassadors to the US and to the UN in Geneva and in New York. We received one acknowledgement of our request for information but no substantive answers to any of the questions posed. In addition, we met with representatives from intergovernmental organizations including the International Organization for Migration (IOM), as well as staff members of NGOs, migrant community leaders, journalists, and human rights lawyers and activists. While Human Rights Watch was able to obtain UNHCR data on asylum seekers in Indonesia, UNHCR told Human Rights Watch it was unable to comment on Indonesia’s treatment of refugees and migrants. Virtually all names of adult migrants interviewed have been replaced by pseudonyms to protect their identity; where the real name is used, that is indicated. All names of children have been changed. Where migrants were interviewed inside detention facilities, we have taken additional steps to avoid the possibility of identifying the individual, for instance by concealing the location of the interview or by withholding precise details of the migrant’s case. Likewise, many staff members of government agencies, intergovernmental organizations, and NGOs in Indonesia are not identified at their request. Human Rights Watch did not assess whether the migrants we spoke to qualified for refugee status. Some, perhaps many, undoubtedly do. This report instead focuses on how the Indonesian government fails to uphold migrants’ human rights, regardless of whether or not those migrants have legitimate asylum claims or other protection needs, and how Indonesia’s policies should be improved. This report focuses on migrants traveling through Indonesia, many with the goal of seeking refuge in Australia. Most lodge refugee claims with UNHCR in Indonesia, which is not party to the 1951 Convention and has made no commitment to provide permanent asylum. UNHCR recognizes some as refugees but has no authority to grant asylum. Some never file refugee claims with UNHCR in Indonesia, hoping instead to file in Australia. An “asylum seeker” is a person who is trying to be recognized as a refugee or to establish a claim for protection on other grounds. Where we are confident that a person is seeking protection, whether in Indonesia or Australia, we will refer to that person as an asylum seeker. A “refugee,” as defined in the 1951 Convention and its 1967 Protocol, is a person with a “well-founded fear of being persecuted for reasons of race, religion, nationality, membership of a particular social group or political opinion” who is outside his country of nationality and is unable or unwilling, because of that fear, to return. In this report, we use the term “refugee” when UNHCR in Indonesia has recognized that person as a refugee, though it should be noted that UNHCR recognition of refugee status is declaratory, which means that people are, in fact, refugees before they have been officially recognized as such. Although international law defines “migrant workers,” it does not define “migrants.” In this report, “migrant” is a broad term to describe third-country nationals in Indonesia. We use the term inclusively rather than exclusively, including people traveling in and through Indonesia and passengers on boats moving irregularly. The use of the term “migrant” does not exclude the possibility that a person may be an asylum seeker or refugee. In line with article 1 of the Convention on the Rights of the Child, the term “child” refers to a person under 18. We discuss children traveling with their families as well as unaccompanied children. The report discusses these groups separately and together, and uses the term “migrant children” to refer to them together. The term includes children seeking asylum or those granted UNHCR refugee certificates. For tens of thousands of migrants and asylum seekers—most from East Africa and South and Southeast Asia—Indonesia is an intended way station along a difficult and dangerous journey to Australia, where migrants hope to find opportunities for a better life and, often, protection from violence and persecution in home countries. Yet most stay in limbo in Indonesia for months or years. 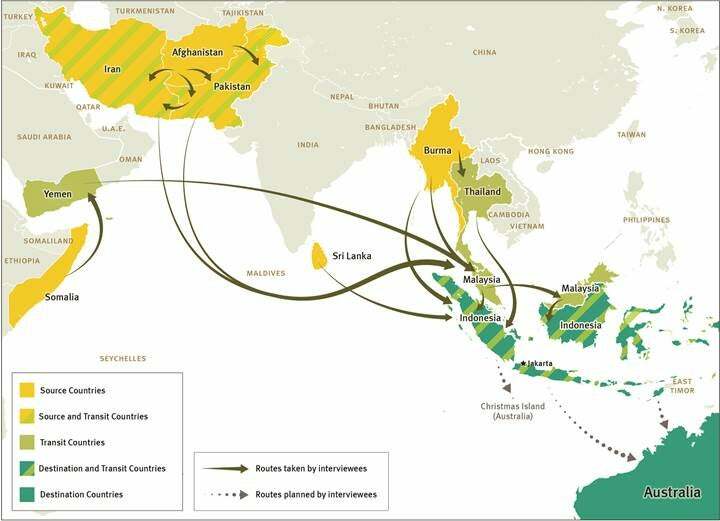 As of February 2013, most refugees and asylum seekers in Indonesia came from Afghanistan, Burma, Sri Lanka, and Iran. Thousands of children travel this route annually—some with their families and others alone. Indonesia has seen a remarkable increase in the numbers of people seeking asylum in the past five years: up from 385 new arrivals in 2008 to 3,230 in 2009. Large numbers of new arrivals continue—in July 2012 alone, for example, there were 753 new cases. At the end of February 2013, there were 9,226 refugees and asylum seekers in the UN refugee agency (UNHCR)’s active caseload in Indonesia, of whom 1,938 were recognized refugees. There are more migrants and asylum seekers who choose not to register with UNHCR and are not included in the statistics above. Some may not wish to lodge an asylum claim, seeing few benefits to the procedure in a country that does not officially recognize refugees, and hoping to move on to Australia sooner rather than later. Other organizations, including the International Organization for Migration (IOM), assist people who are not registered with UNHCR; IOM, for example, reports as of February 2013 487 beneficiaries who have never registered with UNHCR or who have been denied refugee status by UNHCR. It is hard to know the total numbers of refugees, asylum seekers, and other migrants in need in Indonesia, many of whom receive no assistance at all. The Indonesian government did not respond to multiple Human Rights Watch requests for information as to how many migrants there are in the country in addition to those registered with UNHCR. Almost all of the migrant children we interviewed—both those who traveled with families and those who traveled alone—had stopped in Indonesia en route to Australia, risky and expensive journeys of months and even years. Most migrants and asylum seekers interviewed cannot fly directly to Australia because they lack visas needed to board planes. Instead, the journey typically involves a smuggler, either in a migrant’s home country or in a neighboring or transit country. For instance, an Afghan might contract with a people smuggler at home, or through Afghan communities in Iran or Pakistan. It cost $1,000 each. We paid a smuggler and used fake passports…. The smuggler said that he would take us to Australia, but then in Indonesia he disappeared…. In Jakarta he took us to a hotel, we stayed the night, and then in the morning he was gone…. Eventually [my brother-in-law] found a Somali man and arranged for us to come here [to the migrant communities outside Jakarta]. We had a lot of problems in Burma.... My parents thought I was in danger so they told me to leave…. The boat ride was long—18 days and nights. We arrived in Thailand, and rested for one day and one night. The Thai navy took our boat motor and our food and put us in the sea. They took us to the middle of the sea and they left us. We had some bamboo and some plastic tarpaulins, so we made a sail. We traveled for three days like that. In the sea we saw a fisherman’s boat. He guided us to Aceh. Police arrested us. [I]t was four hours long and we landed in Sumatra. The smuggler’s contact met us in Indonesia and took us to his house. We stayed one or two days there…. He sent us to another place in Sumatra, and we spent three months there. Every day he would come and tell us, “Oh tomorrow I will send you [to Jakarta].” We couldn’t go outside at all. One day he dropped us at the Padang airport, all 12 Afghan Hazaras [eleven adults and one child]. We were caught in the airport by the police. Azim M. was also 17 when he traveled from Kabul with smugglers in August 2012. He went to Dubai, and then to Jakarta, where a smuggler promised to take him on to Australia. “He promised that after one month he would take me, but nothing has happened,” Azim said. Being smuggled to Indonesia is much more expensive than making the same trip by commercial plane. Our interviewees reported varying costs: for example, 300,000 Sri Lankan rupees (around $2,363) for one unaccompanied boy who traveled from Sri Lanka to Indonesia; $3,200 for a Rohingya family of three that traveled from Malaysia to Indonesia (having previously made a separate trip from Burma to Malaysia); and between $7,000 to $12,000 for unaccompanied boys who traveled from Afghanistan to Indonesia. Similar trips by air, according to fare quotes found on-line in May 2013, are significantly cheaper: for instance, a one-way ticket from Colombo to Jakarta costs around $400-500; a one-way ticket from Kabul to Jakarta costs around $750-1,000; and a one-way ticket from Kuala Lumpur to Jakarta costs less than $100. Once in Indonesia, many migrants and asylum seekers will contract with smugglers for onward travel to Australia through a dangerous boat trip. This costs an additional fee, which varies greatly but some estimates place it between $3,000 and $6,000. Boats leave from many locations, including Jakarta, towns in southern Java, and Kupang in West Timor. Many boats trips are intended for Christmas Island (one of the closest Australian territories to Indonesia). The boat journeys are incredibly risky. Smugglers, bound by no safety regulations, overload unseaworthy boats and often fail to supply adequate amounts of fresh water, food, or fuel for the journey. Sometimes the journey is deadly. Almost 1,000 people died on the crossing between 2001 and 2012, according to known statistics—a period in which the numbers of people attempting the crossing has grown considerably. There are no official passenger records for these unregulated, illegal journeys, and many hundreds more people go missing, presumed drowned, each year. Despite the risks of the onward boat journey to Australia, many migrants and asylum seekers we interviewed felt that attempting to make the trip was preferable to the hardships of life in Indonesia. When a boat goes into distress, Australian or Indonesian search-and-rescue obligations are triggered. Some boat passengers hope merely to reach Australian territorial waters in order to call for help there. Migrants and asylum seekers receive a poor welcome in Indonesia, which has faulty or non-existent mechanisms for protecting asylum seekers and child migrants. A variety of government bodies in Indonesia offer incomplete care for migrants in Indonesia. The Directorate General for Immigration oversees immigration detention facilities and should take responsibility for migrants outside of detention but does not meet these duties. Likewise, the Ministry for Social Welfare is responsible for child protection, but is not tasked to protect migrant children. Indonesia has a recent history as a country of emigration, and indeed, the Indonesian government takes steps to protect its own citizens abroad. Indonesia has ratified the International Convention on the Protection of the Rights of All Migrant Workers and Members of their Families, and it takes measures to aid Indonesians working as, for instance, domestic workers in Malaysia or elsewhere. Indonesia has also taken steps toward assisting refugees, for instance by donating to UNHCR’s annual appeal in 2012 for the first time in over a decade. Because Indonesia has not ratified the 1951 Refugee Convention or its Protocol and does not have adequate domestic asylum laws, the protection of asylum seekers and refugees in Indonesia has fallen to UNHCR. IOM assists the government in operating migration detention facilities and supports some migrants outside detention; as of February 2013, it was assisting 2,946 refugees and asylum seekers in Indonesia, approximately half of whom were detained. Australia has ratified the 1951 Refugee Convention and its 1967 Protocol and implemented it through domestic laws and procedures, and asylum seekers who reach Australian territory can apply for refugee status there. In addition, Australia resettles several hundred refugees recognized in Indonesia each year, and the government increased the number of places available for resettlement in 2012. Yet there are not enough resettlement places available for all recognized refugees in Indonesia. Despite its ratification of the Refugee Convention, Australia has instituted punitive asylum policies that make it difficult for refugees to enter the country and ask for protection. Australia has long maintained policies, including offshore processing, that deter “irregular maritime arrivals” from reaching the country. But Australia, a geographically isolated state, has erected visa regimes and other legal barriers that make it almost impossible for asylum seekers to arrive spontaneously by air legally. Australia has repeatedly sent asylum seekers arriving by boat to Nauru and Papua New Guinea for “offshore” refugee processing, despite human rights groups repeatedly raising concerns over children’s and asylum seekers’ rights. In 2012, Australia reinstated this policy after fashioning a legal mechanism to overcome a high court ruling that had found it unlawful. Yet Australia’s reinstated policy is not likely to effectively deter boat migration. These policies and others are designed to discourage “queue jumpers,” positing that refugees should wait in third countries for resettlement to Australia. In reality, there is no queue for resettlement. The consequence of these policies is that people fleeing Afghanistan, Burma, Pakistan, Sri Lanka, and elsewhere get stuck in Indonesia, faced either with a prolonged wait for a slim chance at resettlement, or compelled to take the smugglers’ boats to Australia at great personal risk. Australia co-chairs, along with Indonesia, the Bali Process, a regional intergovernmental body on people smuggling and trafficking. The recent initiative, with UNHCR, to map the protection needs of unaccompanied and separated children in the southeast Asian region is a welcome start. However, as co-chairs, both countries should ensure that immigration enforcement measures that emerge from the Bali Process prioritize children’s rights above policing measures. While states retain the capacity to control their borders, they also must respect the rights of all children in their territories, including non-nationals. Unaccompanied children (children who travel without parents or other guardians) are particularly vulnerable to rights violations outside of their country of origin. In recent years, around 1,000 children annually have arrived in Indonesia after traveling alone from Afghanistan, Burma, and other countries. During the year 2012, for example, 1,178 unaccompanied minors were registered in Indonesia by UNHCR. Most were boys, and 81 percent were from Afghanistan, with Pakistan and Burma as other main countries of origin. While most unaccompanied children arriving in Indonesia are 16 or 17, some 3 percent of the arrivals in 2012 were below 14 years old. Because some of these children move through Indonesia relatively fast, and because children age out of this category, the cumulative numbers of unaccompanied minors in the country fluctuates. As of March 2013, there were 718 unaccompanied minors registered with UNHCR in Indonesia; 121 of them, or 16 percent, were in detention. There are likely more unaccompanied minors in Indonesia than those included in UNHCR’s statistics since not all children register with UNHCR, either because of periodic backlogs in UNHCR’s registration system, or because they decide that registration does not provide any significant benefits. Others may be in detention awaiting UNHCR’s first visit, which can take weeks or months. According to the Committee on the Rights of the Child, these children deserve special care. The committee, the body authorized to interpret the UN Convention on the Rights of the Child, a treaty to which Indonesia is party and which it must follow, issued General Comment No. 6 in 2005. General Comment No. 6 dictates that when unaccompanied migrant children enter a country, they should be assigned a guardian who can look after their material needs, and receive legal representation in immigration proceedings. Yet Indonesia, for the most part, fails to meet the obligations described in General Comment No. 6. It leaves these children without guardianship, so no-one takes responsibility for assisting these children in accessing basic services or making decisions about future migration. They are not given free legal representation, making it hard for them to understand asylum proceedings and present their case. As discussed below, every year hundreds are detained with unrelated adults, and many are subject to physical abuse. Of those not detained, only a handful of children have shelter, and others are left to fend for themselves. Indonesia fails to provide unaccompanied migrant children in its territory with guardianship, despite its obligations to protect this exceptionally vulnerable group. Without a guardian, children have no one to look after their basic needs, and do not receive guidance on changing their migration status or on other matters. Some children remain in detention, while others are on the streets without any assistance with basic needs such as shelter and food. As far as Human Rights Watch is aware, no Indonesian government agency has been given the legal responsibility for providing guardianship to unaccompanied migrant children. An NGO, CWS, runs a shelter program for approximately 90 unaccompanied minors in Indonesia but describes the scope of their mandate as “a care and maintenance program,” not a formal assignation of guardianship. The government of Indonesia is failing not only in its responsibility to provide guardians but also to provide adequate shelter for unaccompanied minors. At the time of our investigation in September 2012, just one organization, CWS, provided shelter for unaccompanied minors, and with 93 children in facilities near Jakarta, those facilities were full. As of March 2013, IOM had negotiated with the North Sumatra Provincial Department of Social Affairs (DINSOS) to house 44 unaccompanied minors with refugee status in DINSOS shelters designed for Indonesian children. IOM hopes that this model might be replicated in other provinces, including Yogyakarta and Makassar. Nonetheless, with more than 1,000 unaccompanied minors arriving in Indonesia annually, and these shelters covering fewer than 140 places, these arrangements are far from sufficient. Many unaccompanied minors are detained, as discussed below. The lack of guardianship and shelter can extend their periods of detention. According to IOM and CWS, unaccompanied minors in detention need to wait for there to be room in a shelter before Indonesia will release them. At the time of our investigation in September 2012, 150 children remained in detention awaiting space to open in a shelter;as of March 2013, there were 121 unaccompanied minors seeking asylum or with refugee status in detention. I don’t get any money. The house costs 600,000 rupiah [roughly US$61], for a bedroom with four people, one small room ... I don’t have a job. The house my family sold [in Afghanistan, to finance his trip], the money from that will last for one more month. After that, I’m not sure what I’ll do. Some boys, vulnerable without assistance, fear arrest or re-arrest. Azim M., an unaccompanied migrant boy from Afghanistan who had arrived in Indonesia two months before his interview with Human Rights Watch, was effectively confined to a small house in an area outside Jakarta that is popular with migrants. “I stay inside the house all day,” he said. “I’m afraid [immigration officials] will find me. I do nothing all day—sit inside all day.” Azim had received a token from UNHCR—a piece of paper the size of a business card indicating a date several months ahead for him to register as an asylum seeker. He said he had no other assistance from them and said he had not communicated with them since. There is a nascent understanding within the region that unaccompanied children need more care. UNHCR, in collaboration with The Bali Process, a regional intergovernmental body on people smuggling and trafficking that Indonesia and Australia co-chair, initiated a mapping project in September 2012 to understand issues faced by unaccompanied and separated children in Southeast Asia. Unaccompanied migrant children in Indonesia receive no legal representation, either in requesting asylum or in challenging detention. Article 37(d) of the CRC mandates that children deprived of their liberty should have prompt access to legal assistance, and the Committee on the Rights of the Child has emphasized that this specifically applies to unaccompanied migrant children in migration detention. None of the unaccompanied migrant children we interviewed said they had legal assistance. Sayed M., a 16-year-old unaccompanied Afghan boy detained at an IDC with unrelated adults told us, “I’ve never seen a lawyer.” Ahmad Z. was 17 years old when he was detained at Pekanbaru IDC. He said that “some people were released by an Indonesian lawyer, but I didn’t have a lawyer.” He remained in detention for almost eight months before UNHCR helped secure his release. The Committee on the Rights of the Child emphasizes that in cases where unaccompanied children are subject to administrative proceedings, including immigration or asylum proceedings, they should be provided with a legal representative (in addition to the guardianship functions described above). Yet unaccompanied migrant children in Indonesia receive no such assistance at any stage in the process of applying for refugee status. It was a cage. Shut. In the jail we stayed there for a long time. I don’t know how many months. —Enayet H., an 11-year-old Burmese Rohingya boy, who said he was detained in migration facilities starting when he was 9 years old. Migrant children—including children in families, unaccompanied children, and very young children—are arbitrarily detained in violent, inadequate detention facilities throughout Indonesia. Immigration authorities and Indonesian police arrest migrants and asylum seekers either as they cross into Indonesia or as they move towards the boats to Australia; NGOs and asylum seekers have also reported arrests in the areas outside Jakarta where many migrants live. Indonesian authorities routinely detain families, unaccompanied migrant children, and adult asylum seekers for months or even years in informal detention facilities and formal Immigration Detention Centers (IDCs). Migrants, including children, are typically detained without judicial review or bail, access to lawyers, or any way to challenge their detention. Of the 102 migrants interviewed by Human Rights Watch, 82 were or had been detained, 76 of those in one or more IDCs. Of the 42 children covered in our research, all but 7 were or had been detained, including children ranging in age from 2 to 17 years old. Thirty-two children were detained in a formal IDC, and 12 were detained in informal facilities (the numerical overlap exists because some children were detained in multiple facilities). Data we received from IOM indicates that as of February 2013, approximately 1,450 refugees and asylum seekers, including children, who fall under IOM’s care were detained. The total number of detainees in migration detention facilities is higher as not all fall under IOM’s mandate. Indonesia operates—through the Directorate General of Immigration under the Ministry of Law and Human Rights—approximately 11to 13 formal IDCs, though not all are always occupied and sometimes officials open facilities temporarily. The larger facilities include Belawan IDC, near Medan; Tanjung Pinang IDC, on Bintan Island; Pontianak IDC, in Pontianak in West Kalimantan; Kalideres IDC, in Jakarta; and Makassar IDC in South Sulawesi. The smaller facilities include Pekanbaru IDC in Riau province in central Sumatra; Manado IDC in North Sulawesi; Surabaya IDC in East Java; Denpasar IDC in Bali; and Kupang IDC in West Timor. Facilities in Bandar Lampung, in southern Sumatra, Balikpapan, in East Kalimantan, and Papua are not always open or do not always contain detainees. Migrants interviewed by Human Rights Watch, including children, reported being held in a number of alternate facilities in addition to the IDCs. Regional immigration offices, including those in Medan, Denpasar, Padang, and Jakarta, have holding rooms or cells, which typically are used to hold migrants for short periods of time (our interviewees who were held in these facilities referred to periods of time less than one month). In addition, Indonesian authorities use hotels or other buildings, with guards (sometimes from the Directorate General of Immigration, and sometimes from the police), to hold groups of migrants for short periods. The total number of informal facilities used to detain migrants is hard to know, as different facilities are open at different times. Indonesia routinely holds children of all ages in migration detention for months or years, rather than use alternatives to detention—such as registration and community monitoring. Young children are detained with one or both parents, and unaccompanied migrant children are held with unrelated adults. Single adults are also detained for lengthy periods. Neither children nor adults have any means of challenging their detention, nor do they know for how long they will be detained. Such indefinite detention without recourse to judicial review amounts to arbitrary detention prohibited under international law. In one room, 10 families lived…. They separated us: Mothers and children in one room, and fathers in another room. They opened the fathers’ room from 8 a.m. to 5 p.m. every day. My father was not allowed to eat dinner with us. An asylum-seeking girl, thought to be from Sri Lanka, walks through Belawan Immigration Detention Center while detained with her family, September 2012. Parents reported worries about the impact of lengthy detention on their young children. For instance, Selva P., a Tamil man, was detained at Kalideres IDC for three-and-a-half months with his daughter, who was then four years old. Men and women are already adults when they have these experiences, but children don’t understand them—the first thing they know in their lives is painful. We have to explain to them many times. Children and adults are also held in informal detention facilities apart from and in addition to the IDCs, including hotels and immigration offices. According to Indonesia’s immigration law, the criminal penalty for illegal entry or illegal exit is maximum one year imprisonment and/or a maximum fine of 100 million rupiah (US$10,315). Any immigrant who enters Indonesia without proper documentation will be regarded as an illegal immigrant, and may be subject to detention awaiting deportation. Detention is permissible until deportation is executed, and where deportation cannot be carried out, for up to 10 years. Immigration officials have discretionary power to move a foreigner who “is sick, will give birth, or is still a child” out of detention and to an alternative location, though the law does not specify what that location would be. Indonesia’s laws do not give migrants or asylum seekers opportunities to challenge their detention, nor do they provide any way for them to know when they will be released. Indeed, migrants rarely if ever have assistance from lawyers in challenging their detention. “There are no lawyers,” said an IOM staffer at Pontianak. Indonesia’s prolonged, automatic migration detention—without the possibility of judicial review or remedy—amounts to arbitrary detention prohibited by international treaties to which Indonesia is party. Article 9 of the International Covenant on Civil and Political Rights forbids arbitrary detention, and the United Nations Working Group on Arbitrary Detention holds that a migrant or asylum seeker placed in detention “must be brought promptly before a judge or other authority.”The Working Group’s mandate to investigate arbitrary deprivation of liberty refers to five legal categories for arbitrary detention, including one describing arbitrary detention as “[w]hen asylum seekers, immigrants or refugees are subjected to prolonged administrative custody without the possibility of administrative or judicial review or remedy.” A prohibition on arbitrary detention is also found in the International Convention on the Protection of the Rights of All Migrant Workers and Members of their Families, ratified by Indonesia in 2012. UNHCR emphasizes that asylum seekers and refugees have the rights to liberty and freedom of movement and that detention must only be in accordance with and authorized by law. Migrant children have a further level of protection from deprivation of liberty under international law. Article 37(b) of the Convention on the Rights of the Child (CRC) mandates that the detention of children “shall be used only as a measure of last resort and for the shortest appropriate period of time.” The treaty body that interprets the CRC has stated that unaccompanied children must not be criminalized for reasons related to their immigration status or illegal entry, and urges states to cease the detention of all children on the basis of their immigration status. UNHCR asserts that family detention should be a last resort, when alternatives to detention are exhausted. Immigration officials, under the Directorate General of Immigration in the Ministry of Law and Human Rights, appear to frequently beat migrants and asylum seekers in Indonesian detention facilities, according to our interviews. Of the 82 interviewees who were or had been detained, 11 reported that they had personally experienced incidents of violence, and 3 of the 11 reported multiple incidents in which they had been physically abused by immigration guards. Nineteen interviewees gave credible, detailed testimony of incidents of violence against others with whom they were detained, with one interviewee reporting multiple instances of violence against others. The experiences documented in this report, while not statistically representative of the detained population, are at least indicative of the types of abuses suffered and the lack of redress available. Interviewees were consistent in their descriptions of the types of violence in detention facilities, describing guards kicking, slapping, and punching detainees, beating detainees with sticks and other implements, burning detainees with cigarettes, and using electroshock weapons. Some migrants reported sustaining lasting injuries. Multiple immigration officials might attack one migrant or a group of migrants in a single incident. Unaccompanied migrant children were among those who reported brutality from immigration officials. In addition, according to our interviews, children as young as four years old have been witness to attacks, including one case in which guards forced children to watch as they beat adult migrants. Human Rights Watch’s interviewees discussed incidents of violence between 2010 and 2011 in each of the four largest detention facilities: Belawan, Pontianak, Tanjung Pinang, and Kalideres IDCs, each of which routinely host asylum seekers, unaccompanied migrant children, and families. We also received reports from detainees of abuse in 2011 at Pekanbaru and Balikpapan IDCs; in summer 2012 at Kalideres IDC; and September 2012 at Belawan IDC. Our interviewees reported violence in informal detention facilities, during arrest, and at police stations between 2010 and 2012. A media report indicates further instances of violence at Surabaya IDC in February 2012, and a support group for asylum seekers reported allegations that guards beat several Afghan men after they tried to escape from Tanjung Pinang IDC in July 2012. Despite the death following a severe beating of an Afghan migrant in Pontianak IDC in February 2012, and some limited accountability that has followed, the government has not launched a systematic review of physical abuse in the immigration detention system. Our interviewees reported instances of violence after February 2012. 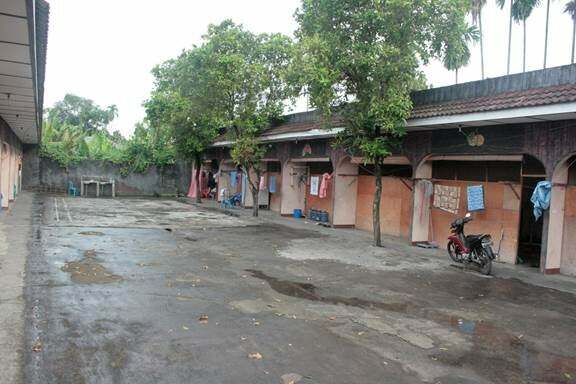 In April 2013, eight migrants died in custody following a riot at the Belawan IDC near Medan, creating further worries about the government’s capacity to maintain an atmosphere free of violence in the detention facilities. International law binding on Indonesia prohibits corporal punishment and cruel, inhuman, and degrading treatment in detention facilities, whether criminal or civil. On February 28, 2012, Taqi Naroye, a 28-year-old Afghan asylum seeker previously detained at Pontianak IDC, was declared dead at a local hospital. Media reports indicate that he had been bound at the wrists, gagged, beaten with a piece of wood and a cable, and electrocuted the night before, while in the custody of immigration guards at the IDC. On February 26, Naroye had attempted to escape from Pontianak with five other asylum seekers. He was recaptured the next day by the Pontianak police and, according to the West Kalimantan chief of immigration, was delivered back to the IDC in good health, prior to receiving the beatings that led to his death. According to UNHCR’s media reports, others who were recaptured at the same time as Naroye, including a 17-year-old unaccompanied boy, were also beaten and some were hospitalized. Several migrants detained at the facility witnessed the beatings, including Mirza, another unaccompanied migrant boy, who himself was kicked by the guards during the incident. At the time of our investigation, several of the guards on duty at the time no longer worked at the center, but it is not clear whether they left or were fired. Ten employees of Pontianak IDC were each sentenced to ten months imprisonment for assault. Yet no systemic investigation into guards’ misconduct—either at Pontianak or nationwide—had been undertaken, nor have comprehensive procedures to train immigration staff or provide a complaints mechanism for detainees been put in place. Human Rights Watch collected accounts of multiple incidents of immigration officials beating children in detention between 2010 and 2012. Unaccompanied migrant boys told us they were beaten in detention, and adults testified that boys detained with them were beaten. One boy traveling with his family was also beaten. Those who were trying to escape were beaten…. Three people got away, four were caught. I was caught. That day I was beaten up very roughly…. There were eight or nine people beating me, most were guards and there was one person from the outside. They hurt my shoulder, my ear, my back. I was beaten with one of the other people who was caught. A psychologist reported that one of his clients, an unaccompanied Afghan boy, was beaten in the same incident that led to Taqi Naroye’s death in 2012 (see above). Mirza, who was 17 years old at the time, was in the courtyard and witness to Naroye’s beating. According to the psychologist, “the guards kicked [Mirza], his ankles, his shins, his feet, shouting at him emotionally. This was to get him away from the area of the beating.” Mirza suffered severe anxiety in the months that followed (see below). Daoud T., an Afghan adult asylum seeker, said he went on a hunger strike at Belawan IDC in 2011, with several other migrants, including an unaccompanied migrant child. Many of them were beaten, said Daoud. “They even beat the 17 year old.” Later testimony from detainees confirms continuing violence at Belawan. Kannan A., a 16-year-old boy detained with his family at Belawan in late 2012, reported that “immigration officers … grabbed me by my shirt and threw me into the room” after he says he was making too much noise. [The other prisoner, who was Bangladeshi] took Sadiq to another room, with three immigration guards…. They locked the door to [the] room. The guards were still in the room while he [the other prisoner] beat Sadiq … I could hear him crying … he was beaten for 10 or 15 minutes. The next day he had black, black marks where [the other prisoner] had punched him…. Sadiq did see a doctor…. The marks stayed for three or four days…. For Sadiq, we complained to UNHCR and to IOM. All the Afghans who were living inside did. But … nothing happened. International law prohibits the use of force against children in detention except in exceptional circumstances to prevent self-injury, injury to others, and destruction of property. Beating children is a serious violation of this standard. Reports of children beaten in immigration detention are symptomatic of a larger problem. Adult migrants said they were also beaten in a number of different detention facilities, including Kalideres, Belawan, Tanjung Pinang, and Pontianak IDCs. The [immigration] police found us…. They caught us and they beat us so badly. They punched me, they kicked me, they slapped me. Eight people each hit me. [After driving back to to Kalideres,] they took us inside and beat us more. They stomped on our food and kicked us in the stomach. Then they put us in a room with nothing. [We were] just sleeping on the floor. The next day they came and woke us up and beat us for 20 minutes…. For about six months we were locked inside of that room. No doctor visit during the six months. My friend got sick. The immigration guards beat me…. We wanted them to open the door so we could see the sky ... We staged a five-day hunger strike…. On day five, the guards slapped and kicked me. I can’t hear in my right ear because of the beating—they slapped my ear so hard. One of my friends used a cellphone. He bribed a guard to buy it. Once the guards discovered him they attacked him—[including] the same officer he had gotten the phone from. They took him to a private room—three guards—and they beat him. He was burned by cigarettes, we could see this when he came out. He was 23 years old. He came out upset and injured. This was in Indonesian and a little in English. I was left bruised. I had black marks in every place of my body. I couldn’t move my hand like that [indicates swinging elbow horizontally]. Khalid also said immigration officers beat him when he was held at the Polonia immigration office for 11 days in 2011: “They … [p]unched me two or three times and asked why I tried to escape. If you’re illegal, you must be beaten…. It was a big guy who beat me, an immigration guy[. ]” Mohammad S. also said he was beaten at the Polonia immigration office when he was held there for seven days in 2010 shortly after entering the country: “The officer beat me because I didn’t want to give him my money. He said, ‘Just be quiet,’ and he beat me. ‘Give me your watch, and money, and be quiet. You’re illegal.’ He hit me. On my face, on many parts of my body.” Faizullah A., who was 17 when he came to Indonesia alone, and 19 at the time of this incident, said immigration officers “grabbed me and slapped me on the face” when they re-arrested him in Medan in July 2012 and took him to the Polonia immigration office. Among our interviewees, children of all ages were witness to harsh episodes of violence, underscoring the unsafe and unhealthy environment of detention. In one case, parents reported that immigration guards specifically forced children to watch as they beat other migrants. Media accounts confirm similar incidents in which children were exposed to violence in detention: for instance, in April 2013, multiple families were detained at Belawan IDC, when a riot broke out that left eight migrants dead and 15 injured. There, the police beat all people. My father, my uncle.... My father was beat, beat; my uncle was beat, beat, beat; but not me. They only beat the big people. I was the only child there. I stayed a long time.... it happened in the police room. The police were very bad in there. 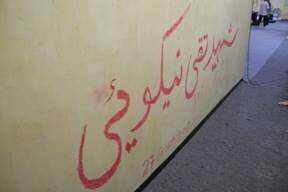 When people run [attempt to escape], they beat.... My father said to them, “I want to go outside, my child to study.” So the police, they beat my father. They [the immigration guards] didn’t have rules. We were in a cage, and they were outside. —Faizullah A., 17-year-0ld unaccompanied Afghan boy held at Pontianak IDC. The immigration detention system appears to have no published regulations for staff behavior, nor are there clear consequences for violations of migrants’ rights. We requested, on multiple occasions, information from the Minister of Law and Human Rights (overseeing the Directorate General of Immigration) regarding procedures regulating staff behavior or providing accountability for abuse or other violations of migrants’ rights; we received no substantive response to these requests. Our own research on Indonesian domestic law and policy yielded no evidence of the existence of comprehensive regulations, and interviews with nongovernmental and intergovernmental organizations involved in providing support to asylum seekers and refugees further supports the notion that comprehensive regulations do not exist. Intergovernmental agencies provide limited, unofficial channels of support for those subject to violence, though they do not have a mandate to monitor abuses. For instance, IOM, which provides assistance to some detainees, has no official capacity or mandate to monitor IDCs, and when staff members hear of abuses they are reported to the Directorate General of Immigration in Jakarta.UNHCR has protection staff in seven locations (Medan, Tanjung Pinang, Pontianak, Makassar, Kupang, Surabaya, and Bogor) who regularly work within the IDCs, but Human Rights Watch is not aware of any UNHCR mandate that would enable them to monitor the facilities. [I]mmigration staff employed in the IDC[s] have received little or no training on how to respond to detainees, there is a lack of guidance regarding detainees’ rights and obligations … the lack of regulations and guidelines tends to lead to choosing strict conduct as immigration staff fears to receive sanctions if detainees abscond. Rudy Prasetyo, an immigration officer at Pontianak, explained how new detainees learn what behavior is expected of them: “Usually one or two Afghan asylum seekers speak English, and IOM tells them the rules… sometimes it’s body language.” Migrants said they were punished for a variety of offenses, including attempting escape, possessing mobile phones, going on hunger strikes, or arguing with guards. There is no independent monitoring body for immigration detention facilities. The Directorate General of Immigration falls under the Ministry for Law and Human Rights, which, as discussed above, does not have clear regulations for oversight of the facilities. As far as Human Rights Watch is aware, no institution has a mandate to monitor treatment of detainees by guards. Conditions for children detained in Indonesian immigration detention facilities violate multiple international standards, leaving children without adequate care. Unaccompanied migrant children are detained with unrelated adults, and many have no contact with their families. No child has meaningful access to education, and recreation and medical care are limited. The prolonged, indefinite detention damages both adult and child mental health. Detention of children—which should only occur in exceptional circumstances—must meet standards in the UN Rules for the Protection of Children Deprived of their Liberty. These rules articulate standards for the provision of education, recreation, and medical care, among others. According to our investigations, several detention facilities in Indonesia failed to meet these standards. I told the police I was 17 years old. They said “it’s no problem for us, you still go to detention.”… There were 34 or 35 other people [in my cell], all male [adults], and [one] other boy. In my block there were three people under 18. They were 17 when we were there. They were just treated the same as us. The immigration officers and UNHCR, they knew they were kids. But they didn’t do anything. The boys felt stressed … They stayed with 40-year-old men, with 50-year-old men; they felt pressure. In Kalideres [IDC] … there were 20 or 30 unaccompanied minors. We got a weekly food supply from IOM. Boys had food stolen from them. Immigration didn’t listen; they laughed when we complained. Whenever the boys talked on the phone with their families, they would cry. The boys cried all the time. They were the most powerless in there. They would get attacked. I’m 16 going on 17. UNHCR knows I’m here. I’ve been here for four months. I talked to UNHCR last week, I have talked to them many times…. I sleep in a room with these guys [pointing to adult men around him]. The Convention on the Rights of the Child and the International Covenant on Civil and Political Rights oblige states parties to separate adults from children in detention, and the Committee on the Rights of the Child emphasizes that this obligation specifically applies to migrant children in detention. The CRC indicates that, in the exceptional cases where children are detained, they should receive care appropriate to their age, including access to education. Every child of compulsory school age has the right to education, which should be provided outside the detention facility in community schools wherever possible. Children above compulsory school age who wish to continue their education should be allowed to do so. An Afghan asylum-seeker walks in the courtyard used for outdoor recreation time at Belawan Immigration Detention Center, September 2012. Some interviewees reported being held for months without access to recreation spaces. © 2012 Kyle Knight / Human Rights Watch. Medical care is made available to some detainees in IDCs through IOM (the organization sends doctors to visit the IDCs and refers some cases to local hospitals). However, some migrants reported delays in receiving care in emergency situations, and children did not always receive routine medical care necessary for child development. Meanwhile, the arbitrary and lengthy detention took a toll on the mental health of many interviewed, affecting particularly children’s mental health. When people got sick, they would bang on the gate to get the officer’s attention. The officers sometimes got mad and kicked them…. I told the immigration officers that my mother was very sick and had passed out. They said, “Oh, the doctor didn’t come today.” Then they told me to go away. I sprayed water on her face and she woke up later … she was with the doctor the next day and he gave her some pills. I had a fever and stomach pain and diarrhea. For three days I asked to see the doctor. The IOM doctor said he wasn’t allowed to come see me because I was in the solitary detention area. I wrote a letter and gave it to an IOM social worker. [Once I obtained permission to see the doctor], the guards came and told me to come close to the door so they could see if I was really sick. But I couldn’t walk at that point, I was too weak and sick after three days of waiting. I threatened to kill myself if they didn’t open the door and help me stand up…. They took me to the doctor, and he gave me some medicine. The doctor told IOM that I was so sick I should go to the hospital, but Immigration said no, and put me back in the cell. [He] became sick because of the water and the smell … We called to immigration but they never came inside to help him … He threw up many times, it was very serious. His eyes became red color and he fainted, fell over many times. Asylum seekers at Pontianak IDC, and their doctors, reported mental health problems connected to lengthy detention. Prolonged detention—especially with no finite time limit—can have a devastating effect on migrants’ and asylum seekers’ mental health, especially that of children, who are thought to be more vulnerable to mental trauma. In 2003, the respected medical journal The Lancet published research finding that lengthy asylum detention in the United States correlates with higher rates of post-traumatic stress disorder, anxiety, and depression, and that detention exacerbates pre-existing symptoms, including mental trauma sustained while fleeing torture or persecution. They lose hope, they lose dreams. There’s no timeframe on when they can have a normal life and go outside as humans. It leads to hopelessness and depression…. My job is to … keep them with some hope, so they can live through the detention period. Children who are detained for immigration purposes are at risk of a variety of psychosocial and developmental problems linked to their detention experiences … The experience of detention may mimic the experience of human rights abuses, persecution and terror.… Children and young people who are detained for extended periods of time are more likely than others to experience feelings of isolation, detachment, and loss of confidence. There were recently [in 2012] seven unaccompanied minors in detention, all of whom were Afghan. Three of them had serious psychological problems; they felt very distressed there. They had trauma from before, back in Afghanistan, they were harassed there…. They have developed a fear of authority figures, so being in detention is hard. One of C.A.’s clients was an unaccompanied migrant boy who witnessed the severe beating that led to the death of Taqi Naroye, an adult asylum seeker, in February 2012. The boy, Mirza, was 17 years old at the time and was beaten himself during the incident (see above). Now, he cannot sleep well, he has nightmares, and his heart beats very fast,” said C.A. “[H]is heart problem … is psychological; he is very anxious…. Before the beating, [he] had problems, psychological problems … After the beating, things got more intense for him, the nightmares started in earnest…. It’s not easy to make this better. Migrants, including children, go for months or years without being allowed to communicate with their family; there are no routine provisions taken for detainees to contact family from Indonesian immigration detention facilities. International standards mandate that individuals shall have the right to inform their families of imprisonment “at once,” and the individual’s capacity to communicate with his family shall not be denied for more than “a matter of days.” The CRC indicates that, in exceptional cases where unaccompanied children are detained, they should be able to contact family. Madudeva N. said he was 17 years old when he arrived in Indonesia alone and was detained, with unrelated adults, for a year at Tanjung Pinang IDC. In detention, in the jail, we didn’t have any conversations with my family. I only talked to my parents after I got out … My parents didn’t know where I was. They just knew I was arrested on the way…. I sent them a letter from IOM but got no reply. I was very worried, because I hadn’t heard from them and I couldn’t talk to them. We had a bad life in our country. We left to seek asylum. We got worse conditions here. We had cement benches for sleeping. No mattress, just bed sheets and a pillow. 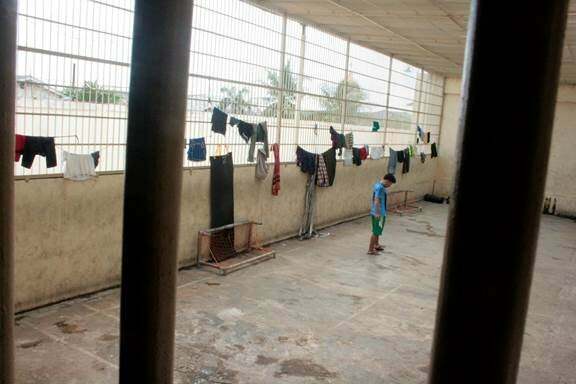 Physical conditions in Indonesian detention facilities are often poor. Immigration detention centers are, at times, filled beyond capacity. Many migrants and asylum seekers reported a lack of basic sanitation facilities, with only short periods of running water; lack of bedding; and flooding in sleeping areas. 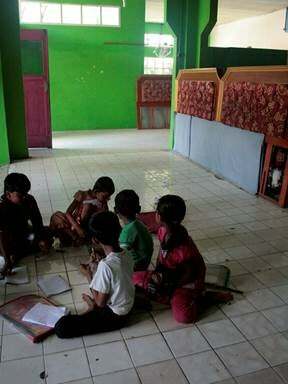 For example, we observed flooded, overcrowded sleeping areas in Pontianak IDC during our visit in September 2012. Detainees at many facilities said their food was dirty, with insufficient nutrition available for young children. Detention of migrants and asylum seekers should conform to international standards, including the UN Standard Minimum Rules for the Treatment of Prisoners, as well as the UN Rules for the Protection of Children Deprived of their Liberty. These rules mandate minimum space; adequate bedding and decent sanitation; access to water; and adequate food. Many of the Indonesian immigration detention facilities that we investigated failed to meet these standards. According to Human Rights Watch interviews, IDCs around the country are, at times, overcrowded beyond their stated capacity. The director of Belawan IDC told Human Rights Watch in September 2012 that there were then “189 detainees, the capacity is 120,” while Human Rights Watch observed, during a tour of the facility, that a family of six was held in a room approximately eight feet by twelve feet, with a single set of bunk beds. Overcrowding results in packed rooms with little or no privacy. Nasir A., from Afghanistan, said he was detained at Pekanbaru IDC with his wife and daughters, then aged 10, 6, and 4 years, for one year. “The room [we stayed in] was a little bigger than these two rooms [a total area about 30 feet by 15 feet] for three families, a total of 17 people. There were no walls, no curtains.” Faizullah A., an unaccompanied migrant boy who was 17 years old when he was detained in 2011 at Pontianak IDC, reported that the room in which he slept was, approximately 20 feet by 30 feet. “There were 34 or 35 other people there, all male ... including [another unaccompanied child],” he said. Migrants also reported overcrowding in the temporary holding cells in immigration offices in Jakarta and Polonia. During the raining, the water would always come into the room. But Immigration wouldn’t do anything, and wouldn’t listen to us when we complained. It was a lot of water, which was about this deep [indicating knee height, about one foot]. The water came from the toilet too. It was very dirty and smelled very bad … The water would take from night until morning [to drain]. In that room, IOM gave us mattresses, a little off the floor made of cement. Always, it was raining. The water was on the floor and then we were sleeping there … There were no beds. For some people who came before us, they had mats. For us, nothing. For four or five months. Then they deported some people to Afghanistan, so we used their mats. It was thin, like a type of carpet. We used the old sheets. They never gave anything else [new sheets]. And on the floor we had nothing. During Human Rights Watch’s visit to Pontianak IDC in September 2012, damp corners of sleeping areas were clearly visible. According to our interviews with detainees while there and to our observations, groups of six to eight migrants and asylum seekers slept on raised concrete platforms with bedrolls or thin mattresses. We had one toilet for 37 people. The water was outside, like this [points at tank]. They [the guards] could turn it on and off, off when they were unhappy. There was no hot water until the last month I was there. At many different facilities, migrants reported they found insects, metal, and other items inside their food. Children, who have special nutritional needs, do not always receive food appropriate for their developing bodies. Arif B., an unaccompanied Afghan boy, was 15 years old when he was arrested. The immigration guards make business … there were two people who each paid $2,000 for their release … they wouldn’t release me because I didn’t have any money.” Mustafa stated that he was detained with “unaccompanied minors … the guards demanded money from them [too] if they wanted to go. Migrants, including unaccompanied children, reported that immigration officials took away their personal property when they were arrested or transferred between detention facilities, and that the property was not always returned. International standards mandate that property should be placed in safe custody, returned to the detainee on release, and that the detainee should get a receipt. Asylum seekers in Indonesia find it difficult to obtain refugee status, which is granted by UNHCR as the Indonesian government has no mechanisms for processing refugees. These difficulties occur even for unaccompanied migrant children, for whom child-specific forms of asylum hearings are appropriate, and whose applications should be reviewed as quickly as possible in light of their increased vulnerability to abuse during the waiting period. Yet translation is inadequate, and children are not given legal assistance. Both adults and children face protracted delays in the processing of their cases: the average time for a first-instance refugee status determination is 12-13 months for people in detention, and 14-15 months for people who are not detained. These delays occur because the Indonesian government takes no responsibility and because UNHCR is understaffed. The consequences of lengthy waits for refugee status determination include the risks of arrest and prolonged detention. Migrants, including children can remain in detention while various stages of their claim are processed, even though they are exceptionally vulnerable migrants. They are vulnerable to abuse while they wait, whether in detention or outside, because Indonesia fails to protect them or provide them with even minimal assistance. Even once refugees are granted status by UNHCR, they do not have sufficient legal status in Indonesia to reconstruct their lives (see Section IV, below). Even once refugees are granted status by UNHCR, they still are not adequately protected in Indonesia. Only a small proportion of the refugees are resettled to a third country, because the number of resettlement places made available by other countries, notably Australia, is smaller than the demand. The statistics provided by UNHCR in April 2013 indicate that 826 people have been resettled in the last three years: 176 people were resettled in 2010, 403 in 2011, and 247 in 2012 (86 percent went to Australia, 7 percent to New Zealand, 3 percent to the US, and the remainder to Norway, Sweden, and Canada). Indonesia is not party to the 1951 Refugee Convention or its 1967 Protocol and does not provide migrants with chance to claim asylum under Indonesian law. UNHCR has a memorandum of understanding with the Indonesian government through which it operates a refugee status determination procedure. UNHCR can issue first an Asylum Seeker Certificate (ASC) while claims are pending and then, after a more detailed interview and recognition as a refugee, a Refugee Certificate (RC). Even with an ASC or an RC, the bearer may not choose their residence, move freely around the country, or work, and the certificates offer only minimal protection against arrest and detention (see Section V, below). Refugees, asylum seekers, and NGOs working with them complained of extended waits for UNHCR processing, to obtain an ASC, to be interviewed for refugee status, and for UNHCR to report back the decision on refugee status. As of April 2013, following significant numbers of new arrivals in 2012, the average times for processing a first-instance refugee status determination (including interview and decision-making) were 12-13 months for detained people, and 14-15 months for people who are not in detention. An individual with an ASC then waits for a refugee status determination interview. In April 2013, the average wait was 8-9 months for a person in detention, and 10-11 months for someone who is not detained.After the interview, the wait continues, this time for the results. In April 2013, the average wait for the results of the interview was 4 months. Consequently, the total wait for a first-instance refugee status determination was 12-13 months for someone in detention and 14-15 months for someone not detained. Some people may choose to appeal a negative decision; the average wait for adjudication of that appeal was 180 days, or 6 months. Asylum seekers reported long waits for UNHCR processing even while in detention, where the timetable should be considerably accelerated. Sher K. waited nine months in detention—six of them in a “confinement” cell with five other men—before his first interview with UNHCR. “Fourteen months later [after the interview], I was finally granted refugee status…. I waited another two and a half months to be released from detention. Sher spent a total of two years, one month, and two weeks in immigration custody. Nabi B. who was interviewed while detained at Pontianak IDC, was still waiting for the outcome of his refugee status determination interview. He said he had waited 5 months for the interview and had been waiting 11 months for the result, for a total of 16 months in detention. It’s been eight months without an interview.… If Immigration will kill me here, I may as well be in Afghanistan.… Due to the late [delayed] process, I must go. I know the situation in Helmand is difficult … after being back for a week I will flee again, to Pakistan. Refugees who traveled through Malaysia and received refugee status from the UNHCR office there had to go through the UNHCR process in Indonesia regardless, and many were detained during this period. Karim Ali S., the father of a Rohingya family from Burma who arrived in Indonesia approximately eight months before meeting Human Rights Watch, said, “we had refugee status in Malaysia, but we have asylum seeker papers only in Indonesia.” A a Tamil man, had refugee status in Malaysia, but spent 11 months in immigration detention before receiving refugee status from UNHCR in Indonesia. Even some vulnerable people may linger in detention, albeit for shorter periods. Shajunan P. was at Tanjung Pinang IDC for two months before UNHCR came to register him: “Because of my artificial leg, I was given priority for my interview. It was three months more to wait until they interviewed me.” After Shajunan received his refugee certificate from UNHCR, he said, “the immigration office told me I had to go to Belawan [IDC] first before I could get released.”Shajunan spent another month at Belawan for a total of six months in detention. Unaccompanied migrant children in Indonesia have access to UNHCR’s procedures to seek refugee status, but also face extended wait times, even though UNHCR tries to accelerate procedures for children. If they do gain refugee status, they still cannot work or build a meaningful life in Indonesia. I went to UNHCR to get the token. I went four times, and then got the [ASC]. It was very difficult between here and Jakarta, because there are checkpoints and I could get caught. I was thinking they could take me to prison…. Every two months you renew the card. That’s when you know if you have an interview [for refugee status] or not. On my second day in Indonesia, I went to UNHCR. They gave me a token for 2013. It just has my name and a date on it. They never asked me my age. There was no special line [for those under 18]…. It was very crowded so the interview went quickly and I didn’t get to tell them my age…. Here we are outside [detention]. But … [w]e’re not all free—there are rules. If we break them, they send us back to the detention center. —Faizullah A., an unaccompanied Afghan migrant who arrived in Indonesia aged 17. We don’t like it here. We have lost our lives … everything is finished. —Kiriya J., a Sri Lankan girl who came to Indonesia with her family when she was 16 years old. Life in Indonesia is extremely difficult for migrant and asylum-seeking children, even when they are not detained. Without legal permission to be in Indonesia, migrants live in constant fear of arrest, unable to go to the police in events of crimes. Asylum-seekers with only tokens have little or no protection, while UNHCR’s asylum seeker certificates and refugee certificates offer only marginal improvements. Even when recognized as refugees by UNHCR, families, unaccompanied children, and others cannot build a life in Indonesia, as they are not given the right to work or move freely around the country. Violating these or other conditions can lead to re-arrest and detention. Asylum seekers receive no assistance at all from the Indonesian government, and are constantly vulnerable to arrest by Indonesian immigration authorities. Once they register and receive an asylum seeker certificate, but while waiting for the outcome of the refugee status determination process, some asylum seekers receive some material and financial assistance through NGOs such as Jesuit Refugee Services (JRS). However, as the numbers of asylum seekers in Indonesia grows, the need far outstrips the capacity for NGOs to respond to this need. Fartuun A. and her family are Somali asylum seekers who have registered with UNHCR living near Bogor, outside Jakarta, where many migrants live. They arrived in Indonesia in June 2011, but only found assistance from JRS in December 2011, after they were able to register as asylum seekers. “Before JRS, no one else helped us. [Only other] Somalis would help us,” said Fartuun. “We can’t work here to take care of the children, to buy food, to pay rent, to make a better future for all. Indonesian authorities restrict asylum seekers and refugees to particular geographical areas of Indonesia, and in some cases forbid them to live outside of assigned housing. Interviewees—including recognized refugees awaiting resettlement—reported that they were rearrested if they broke these rules. International law provides for freedom of movement for refugees, such that refugees may choose where to live within their country of refuge, and may move freely around the country. I talked to a smuggler, an Indonesian man, who took us to Polonia airport [to go to Jakarta]. I paid $500. He left us in the airport, me and another Afghan man. Airport security asked for paperwork. We didn’t have one, we showed the refugee certificate. They knew better about us, they called Immigration…. Immigration came and took us to Polonia office, and after 11 days we were taken to Belawan…. After three months they sent me back to [the assigned residence in Medan]. Indonesian authorities do not allow refugees to work, contravening international standards. Children of asylum seekers have limited capacity to enroll in school (which varies by area). Even when they can enroll, they face significant language barriers. [I]t’s not good. We cannot go to school because we are refugees…. The Indonesian government doesn’t make it possible for us to live here. I want to study maths, English, and science … I can do that when I leave here. Rohingya children seeking asylum with their families attend an English class sponsored by the International Organization for Migration at a living center for asylum seekers in Medan, September 2012. Though many children do not have access to formal education, IOM in collaboration with some local NGOs provide some informal education, including English classes, for refugees and asylum seekers who fall under IOM care. Yet IOM’s programs are not sufficient to replace formal education programs. Under international law, a child’s nationality cannot act as a barrier to accessing education. The Indonesian government must ensure that migrant children have full access to schools, not just to English programs or other forms of informal education that intergovernmental or nongovernmental agencies provide. I am nothing now…. All I do is worry about my family and my future. Three years like this now. —Ahmad Z., who traveled alone from Afghanistan to Indonesia when he was 17 years old. For refugees and asylum seekers, including children, there are few viable options for building a life in Indonesia. Their only hope is for UNHCR to resettle them, a protracted and often unsuccessful process. Faced by years in limbo in Indonesia, asylum seekers, recognized refugees, and other migrants choose the more dangerous but more immediate route of taking boats illegally to Australia. There is an Afghan proverb, “being killed is better than having to wait.” Our waiting here is like a traffic light that is always red. We have no idea when it will turn green. —Daoud T., a refugee waiting for resettlement. People who successfully make it through UNHCR’s process and gain refugee status still lack protection in Indonesia, at risk of rearrest and unable to work (see above); to the best of Human Rights Watch’s knowledge, however, they are generally protected from refoulement, meaning that the Indonesian government does not try to send them home. Left in limbo in Indonesia, resettlement in another country, through UNHCR, is the best option for these people. Yet only a few refugees are actually resettled, and the wait can be long. In the three-year period from 2010 to 2012, 826 people were resettled from Indonesia to a third country (in 2010, 176 refugees were resettled; in 2011, 403 were resettled, and in 2012, 247 were resettled). 86 percent of these people went to Australia, with the remainder to New Zealand, Canada, Norway, Sweden, and the US. Given that just 826 people were resettled from Indonesia in a three year period, and given that as of February 2013, there were 1,938 refugees recognized by UNHCR in Indonesia, it is clear that many face a long wait. As with refugee status determination itself, there are several steps to the resettlement process, with no guaranteed outcome. There are currently 754 refugees in Indonesia whose applications for resettlement have been submitted to a third country, and another 247 whose applications have been accepted (by Australia and New Zealand) and who are awaiting departure. In 2012, Australia increased, to its credit, the numbers of resettlement places available, but this does not answer the need in Indonesia. I don’t have any money so I don’t have any way to help [my mother in Somalia]. This month I asked UNHCR to send me back to Somalia because I’d rather die with my mother. I told them, “If you won’t send me to another country, send me home.” I do nothing all day. No classes, no job, it’s like my life is on embargo. There was an 18-year-old here [in this residential facility in Medan], but he left recently to get on a boat because he had been waiting for two years. —Sher K., an Afghan refugee. We’re not satisfied here. We don’t know when we’ll be resettled. UNHCR says they can’t promise we will go to a third country. So people go [take the boats] to Australia. —Khalid A., an Afghan refugee. Unaccompanied migrant children are among those who choose to risk the boat journeys. They reported that they felt they had few options. None of the unaccompanied migrant children with whom we spoke attended school in Indonesia, and children with refugee status, like adults, do not have permission to work. Indonesia has no alternative immigration statuses available for these children. Asylum-seeking and refugee children in Indonesia are trapped in a prolonged waiting game with no certain outcome. Many have fled desperate situations, and hope to find refuge in Australia or elsewhere. Yet Indonesia detains them without judicial review, subjecting them to poor conditions and brutal treatment in detention facilities. Outside detention, asylum seekers and refugees cannot work legally and are prohibited from moving freely around the country. By failing to ratify and implement the 1951 Refugee Convention, Indonesia leaves refugees and asylum seekers living at the margins of society with no chance to integrate. Many wait months or years for UNHCR to process their cases. Only a small number will ultimately be resettled to a third country. It is no surprise, therefore, that some asylum seekers decide that boarding a rickety boat to travel irregularly to Australia looks like a risk worth taking. Unaccompanied migrant children fall into a legal void. With no government agency taking responsibility for their guardianship, they are left in detention or on the streets, without the legal or material assistance to which they are entitled. Without a viable future in Indonesia even once released from detention, and with a long wait for the possibility of resettlement, many unaccompanied migrant children take the rash decision to take dangerous boat journeys. Children who migrate with their families also have no future in Indonesia. Often detained in terrible conditions as young children, they are exposed to violence and left without an education. Once released, they and their parents have no secure immigration status in Indonesia, and children have few prospects for gaining an education and no way of becoming a part of Indonesian society. Instead of leaving people without options, compelling them to take dangerous boat journeys, Indonesia should create a legal environment that protects asylum seekers and refugees, including through ratification of the 1951 Refugee Convention and its 1967 Protocol. Indonesia should stop detaining children without review, impose an absolute ban on detention of unaccompanied children, and immediately reform its immigration detention system. Australia should support its neighbor in establishing these policies, and should lift punitive asylum policies in order to minimize the risks of smugglers’ boats. Migrants and asylum seekers will continue to come to Indonesia, in numbers that are likely to continue to increase. Indonesia should establish an immigration screening system that, while including enforcement of immigration laws through proper and humane deportation of migrants who do not have claims to enter or remain, protects children’s rights, recognizes valid claims for asylum, and offers a viable future for those who can remain in the country. Accede to the 1951 Refugee Convention and its 1967 Protocol and implement their provisions into Indonesian law, providing a fair and timely asylum process accessible to all migrants who want to make refugee claims. Provide appropriate living conditions for those seeking asylum and those granted refugee status, including by allowing the right to work and the right to move freely throughout the country. Provide all children in Indonesia, including migrant children and child asylum seekers, access to education. End arbitrary detention of migrants and asylum seekers. Provide all migrants detained with access to mechanisms to challenge the legality of their detention. Develop a clear, nationally applicable standard operating procedure for immigration detention that prevents the detention of vulnerable migrants and asylum seekers, establishes benchmarks for acceptable conditions of confinement, and enables those detained to access an effective complaints procedure about immigration staff conduct. Strictly enforce the prohibition of abuse of migrants in detention facilities, and implement a thorough, nationwide review of violence, abuse, and corruption in detention facilities. Ensure that children are never subject to or witness to violence in detention facilities. Enable the National Commission on Human Rights (Komnas HAM), the Inspector General, or other independent monitoring body, to be responsible for oversight of a complaints procedure about immigration staff conduct. Provide migrants with access to lawyers, including free legal assistance for unaccompanied migrant children. Consider the detention of children in families as an absolute last resort, after exploring all alternatives to detention, such as registration and community monitoring for them and for their family members, while always prioritizing the child’s best interests and right to family unity. Immediately prohibit the detention of unaccompanied migrant children and provide them with safe accommodations outside detention facilities. Grant unaccompanied children lawful status for as long as they are in Indonesia, to ensure their enjoyment of rights and protection on an equal basis with Indonesian children and to protect them from repeated arrest and detention. Resolve which division within the government should take responsibility for guardianship of unaccompanied migrant children. Take immediate steps to ensure that there are sufficient places in shelters for unaccompanied migrant children, and that they have access to education, adequate nutrition, and contact with family members abroad. Establishing a meaningful guardianship system through which each unaccompanied migrant child in the country is assigned, as soon as possible after arrival in the country, a guardian with the authority to be present in all decision-making processes, including immigration hearings, care arrangements, and efforts to make long-term plans for children, and who is knowledgeable about child care in order to ensure that the child’s legal, social, health, psychological, material, and educational needs are adequately covered. Increasing the number of places available in care facilities (such as shelters and foster care settings) to the level required to ensure placement for all unaccompanied children in the country. Establish and enforce minimum standards for all care placements and provide specialized care for particularly vulnerable children, such as those who are victims of trafficking. Ensure care placements provide social and educational services, access to free legal aid, and protection from violence and ill-treatment. Design programs to reach out to unaccompanied children who live outside state-sponsored care to ensure their protection and educate them about risks of further travel. Set up a foster family system and provide adequate support to foster parents in the exercise of their functions. In cooperation with the Directorate General of Immigration, setting up a registration and tracking system for unaccompanied children, to account for every child. Investigate incidents of unaccompanied children who abscond from care centers and design strategies to counter such occurrences. Ensuring that unaccompanied migrant children have access to free legal assistance in asylum proceedings and other legal and administrative proceedings. Consider the detention of children in families as an absolute last resort, after exploring all alternatives to detention for them and for their family members, and while always prioritizing the child’s best interests and right to family unity. Develop a clear, nationally applicable standard operating procedure for immigration detention that prevents the detention of vulnerable migrants and asylum seekers, establishes benchmarks for acceptable conditions of confinement, prohibits bribery or corruption among staff members, and enables those detained to access an effective complaints procedure about immigration staff conduct. Immediately bring detention conditions in line with international minimum standards, including standards relating to overcrowding, water and sanitation, nutrition, and access to recreation, among others. Immediately cease detaining children with unrelated adults. Provide appropriate, age-specific education to all children in detention facilities of compulsory primary education age, and allow children of secondary education age to continue their education if they desire. Ensure that detainees have the means to communicate with family members, UNHCR, and legal representatives. Ensure free and full access for independent agencies such as national and international governmental organizations and non-governmental organizations, and permit them to monitor detention conditions. Issue clear standards and provide training to ensure that violence, ill-treatment, bribery, and corruption do not occur in the detention facilities under your jurisdiction. Institute accountability mechanisms, including a confidential individual complaints procedure, to prevent abuses and redress corruption in immigration detention facilities. Ensure free and full access for independent agencies such as international governmental organizations and non-governmental organizations, and permit them to monitor detention conditions. Promptly investigate any allegation of ill-treatment of migrants and asylum seekers, including children, by officials and hold perpetrators fully accountable under the law. Take targeted and comprehensive measures to prevent ill-treatment of migrants, including unaccompanied children, in the custody of state agents. Put in place victim protection mechanisms during investigations and make public statements condemning such acts. In cooperation with the Ministry of Social Affairs (or whichever agency takes guardianship for unaccompanied children), set up a registration and tracking system for unaccompanied children, to account for every child. Investigate incidents of unaccompanied children who abscond from care centers and design strategies to counter such occurrences. Ensure that all unaccompanied migrant children in Indonesia are given an opportunity to seek asylum, and are provided representation by a guardian and a lawyer for all unaccompanied children who seek asylum. Prioritize the determination of asylum applications by unaccompanied children while ensuring a fair and full assessment of their claim. Ensure that all migrant children in Indonesia—including unaccompanied children and children with their families—have timely access to quality education, both in the exceptional cases where they are detained, and when they are living outside detention. Refrain from arresting refugees, asylum seekers, and people with tokens from UNHCR. Use only the minimum force necessary in apprehending migrants and investigate and punish instances of excessive force. Conduct comprehensive investigations into abuse claims made by migrants and asylum seekers in immigration detention, including by putting in place victim protection mechanisms during investigations. Lead by example by lifting punitive asylum policies (including offshore processing and harsh visa regimes) and allowing those seeking asylum to reach Australian territory, thus minimizing the risks of the smugglers’ boats. Strongly promote and facilitate the development of refugee law and refugee protection in Indonesia, including by encouraging the Indonesian government to ratify the 1951 Refugee Convention and its 1967 Protocol, and by working with the Indonesian government to develop its capacity to assess asylum claims and protect refugees. Support Indonesia in developing appropriate laws and policies to respond to the protection needs of unaccompanied migrant children, including those enumerated by the UN Committee on the Rights of the Child in its General Comment No. 6. In regional intergovernmental dialogues that address migration issues, push for a more humane approach to migration that prioritizes children’s rights about immigration enforcement. Make funding of migration activities in Indonesia conditional on respect for human rights and international standards on migrant detention conditions, including provisions for monitoring and review. Pressure Indonesia for accountability on instances of abuse in immigration detention. Accelerate resettlement procedures and continue to increase the number of refugees resettled from Indonesia to Australia. Strongly promote and facilitate the development of refugee law and refugee protection in Indonesia, including by encouraging the Indonesian government to accede to the 1951 Refugee Convention and its 1967 Protocol, and by working with the Indonesian government to develop its capacity to assess asylum claims and protect refugees. Call on the Indonesian government to cease detaining asylum seekers and refugees with UNHCR documents, to consider the detention of children in families as an absolute last resort, and to prohibit the detention of unaccompanied migrant children. Provide financial and technical assistance to the Indonesian government in implementing new policies on migrants, asylum seekers, and unaccompanied migrant children. Provide increased financial assistance to UNHCR and non-governmental organizations conducting refugee status determinations, so that these procedures can move more speedily, and so that people in detention, unaccompanied minors, and other vulnerable groups can be prioritized. Recognize the importance of education for migrant children, and support their education both outside detention and when they are detained. Uphold refugee rights in the establishment of all policies and practices on regional immigration enforcement. Prioritize children’s rights in immigration enforcement, including by providing specialized protection for unaccompanied migrant children, and by urging states to cease the detention of migrant children. While recognizing the parameters of the resource constraints faced by UNHCR in Indonesia, urgently speed up the very slow processing of refugee claims, if necessary by increasing the number of UNHCR eligibility officers, interpreters, and support staff. Prioritize to an even greater degree particularly vulnerable groups, including unaccompanied migrant children, so that the processing time on these claims is significantly reduced. Given the issues faced by those subject to prolonged detention, prioritize to an even greater degree claims made by those detained. End the system of giving “tokens” or appointment slips to asylum seekers who approach UNHCR, which leaves people without legal protection for extended periods. Issue asylum seeker certificates as soon as that person is in touch with the office, to minimize the risk of arrest and other maltreatment. Promote fair practice standards in UNHCR’s refugee status determination process by permitting asylum seekers legal representation and providing unaccompanied migrant children with free legal assistance. Expand advocacy efforts with the government of Indonesia to ensure that unaccompanied migrant children have adequate care, including shelter and access to basic necessities. In the course of providing nutrition assistance to people under IOM’s care in detention, ensure that adequate food with appropriate nutritional standards is provided to all children in its care in immigration detention facilities. Monitor conditions of confinement for all asylum seekers and children in its care in immigration detention facilities, and report issues to the Directorate General of Immigration. Recognizing resource constraints, and while the government of Indonesia has failed to fulfill its responsibility to provide access to education, expand IOM’s educational programming for children both inside and outside detention. Continue to work with the government of Indonesia to ensure that unaccompanied migrant children have adequate care, including shelter and access to basic necessities. Expand translation programs to ensure that asylum seekers have access to adequate translation in the course of their proceedings with UNHCR. Consider migrant children, including asylum-seeking children and unaccompanied migrant children, as a core element of UNICEF’s programming in Indonesia. Prioritize advocacy that urges the government of Indonesia to end the detention of migrant children. Run programming and support programming run by others that responds to the protection needs of unaccompanied migrant children, including those enumerated by the UN Committee on the Rights of the Child in its General Comment No. 6. Work to ensure that all migrant children in Indonesia, whether detained or not, whether unaccompanied or with their families, have access to education. This report was researched by Alice Farmer, researcher, and Kyle Knight, Algrant fellow, in the Children’s Rights Division, in August and September 2012. Alice Farmer wrote the report. The report was edited by Zama Coursen-Neff, director of the Children’s Rights Division; Andreas Harsono and Heather Barr, researchers in the Asia Division; Phelim Kine, deputy director of the Asia Division; Bill Frelick, director of the Refugee Program; Dinah PoKempner, general counsel; and Danielle Haas, senior editor. Beneva Davies and Laura Schulke, associates, and Angeline Tandiono, intern, provided research and production assistance. Grace Choi and Fitzroy Hepkins provided additional production assistance. All maps were designed by John Emerson. We are grateful to the individuals who agreed to share their personal stories, as well as all of the officials, service providers, and experts who agreed to be interviewed. We thank all of the organizations and individuals who supported this work, facilitated interviews, and provided invaluable insight. Human Rights Watch interview with Barat Ali Batoor (real name), Cisarua, August 30, 2012. Afghanistan has four major ethnic groups of which Hazara people are one. Hazara people have traditionally been discriminated against in Afghanistan, deprived of access to services and employment, and have periodically been the victims of ethnic violence. A minority Muslim group in Burma. Convention on the Rights of the Child (CRC), adopted November 20, 1989, GA Res. 44/25, annex, 44 UN GAOR Supp. (No. 49) at 167, UN Doc. A/44/49 (1989), entered into force September 2, 1990, ratified by Indonesia on September 5, 1990, art. 1. Email from Steven Hamilton, deputy chief of mission, International Organization for Migration Indonesia, to Human Rights Watch, March 13, 2013. UNHCR, “Indonesia: Fact Sheet September 2012,” http://www.unhcr.org/50001bda9.html (accessed March 23, 2013). UNHCR, “UNHCR in Indonesia,” http://www.unhcr.or.id/en/unhcr-inindonesia (accessed April 23, 2013). See, e.g., “Asylum Seekers Risk All for Australian Dreamland,” Associated Press, July 6, 2012, http://dawn.com/2012/07/06/asylum-seekers-risk-all-for-australian-dreamland/ (accessed April 9, 2013) (“Unwilling to languish for years here in detention centers while their cases are heard, many board smugglers’ boats to attempt the 500-kilometer trip to Australia’s Christmas Island.”). Human Rights Watch group interview with Karim Ali S., Ciawi, September 7, 2012. Human Rights Watch group interview with Fartuun A., Cisarua, September 7, 2012. Human Rights Watch interview with Rafiq A., Medan, September 13, 2012. Human Rights Watch interview with Ahmad Z., Yogyakarta, September 18, 2012. Human Rights Watch interview with Azim M., Cisarua, September 9, 2012. Human Rights Watch interview with Madudeva N., Medan, August 23, 2012. Human Rights Watch interview with Ahmad Z., Yogyakarta, September 18, 2012; Human Rights Watch interview with Faizullah A., Medan, August 25, 2012; Human Rights Watch interview with Arif B., Cisarua, August 30, 2012. Ben Bland, Neil Hume, “Australia braces for seaborne refugees,” Financial Times, July 3, 2012, http://www.ft.com/intl/cms/s/0/7bea2c5c-c4fa-11e1-b6fd-00144feabdc0.html (accessed April 9, 2013). “Indonesian Crew of Wrecked Refugee Ship Jailed,” Agence France Press, September 26, 2012, http://www.thejakartaglobe.com/home/indonesian-crew-of-wrecked-refugee-ship-jailed/546603 (accessed April 9, 2013); Kathy Marks, “Boat Tragedy Reignites Australian Refugee Debate,” National, December 9, 2010, http://www.thenational.ae/news/world/asia-pacific/boat-tragedy-reignites-australian-refugee-debate (accessed April 9, 2013). See, e.g., “Indonesian refugees return home after boat sinks en route to Australia,” Reuters, August 31, 2012, http://www.guardian.co.uk/world/video/2012/aug/31/indonesian-refugees-boat-sinks-australia-video (accessed April 9, 2013). See, e.g., Lanai Vasek and Brendan Nicholson, “Refugees recoil at family disappearance,” Australian, August 15, 2012. Human Rights Watch interview with Arif B., Cisarua, August 30, 2012. Both Australia and Indonesia are signatories to International Convention on MaritFime Search and Rescue, 1979, as Amended. State parties are obliged to extend aid without regard to nationality, status, or circumstances of the person or people in distress (Annex of the Convention Chapter 2.1.10, http://treaties.un.org/doc/Publication/UNTS/Volume%201405/volume-1405-I-23489-English.pdf (accessed April 25, 2013); signatories listed at “Status of multilateral Conventions and instruments in respect of which the International Maritime Organization or its Secretary-General performs depositary or other functions,” March 2013, http://www.imo.org/About/Conventions/StatusOfConventions/Documents/Status%20-%202013.pdf (accessed April 25, 2013), p. 410. The functions of the Ministry of Women Empowerment and Child Protection are stipulated in Presidential Regulation No. 24/2010, article 46. Neither this nor the Law on Child Protection No. 23/2002 clarifies responsibilities for migrant children. International Convention on the Protection of the Rights of All Migrant Workers and Members of Their Families (Migrant Workers Convention), adopted December 18, 1990, G.A, Res. 45/158, annex, 45 U.N. GAOR Supp. (No. 49A) at 262, U.N. Doc. A/45/49 (1990), entered into force July 1, 2003, art. 16. According to 2009 data from the National Agency for the Protection and Placement of Indonesian Migrant Workers, there were approximately 4.3 million Indonesians living abroad for work at that time, typically as laborers or domestic workers, International Labour Organization, “Combating Forced Labour and Trafficking of Indonesian Migrant Workers,” http://www.ilo.org/jakarta/whatwedo/projects/WCMS_116048/lang--en/index.htm (accessed June 10, 2013). The population of undocumented migrants is estimated to be two to four times that amount. Organizations such as Migrant Care, a Jakarta-based NGO, put current estimates of documented and undocumented Indonesians abroad at more than 10 million, Human Rights Watch interview with Anis Hidaya, Migrant Care, Jakarta, August 30, 2012. Indonesia donated US$ 50,000 to UNHCR in 2012. UNHCR, “2013 UNHCR Regional Operations Profile – South-East Asia,” http://www.unhcr.org/pages/49e488116.html (accessed April 23, 2013). Bill Frelick and Michael Timmins, “Exporting Australia’s Asylum Policies,” Huffington Post, October 23, 2012. “Deport boat migrants, Australian gov’t urged: Report adds fuel to bitter debate,” Associated Press, August 13, 2012; “Australia: End Offshore Transfer of Migrant Children,” Human Rights Watch news release, November 24, 2012, http://www.hrw.org/news/2012/11/24/australia-end-offshore-transfer-migrant-children. “Australia: End Offshore Transfer of Migrant Children,” Human Rights Watch news release, November 24, 2012, http://www.hrw.org/news/2012/11/24/australia-end-offshore-transfer-migrant-children. Email from professional working with refugees to Human Rights Watch, April 4, 2013. UN Committee on the Rights of the Child, “Treatment of Unaccompanied and Separated Children Outside their Country of Origin,” General Comment NO. 6, UN Doc. CRC/GC/2005/6 (2005). General Comment No. 6, para. 33. Human Rights Watch interview with CWS staff, Jakarta, September 7, 2012. Email from Steve Hamilton, Deputy Chief of Mission, IOM Indonesia, to Human Rights Watch, April 2, 2013. Human Rights Watch interview with CWS staff, Jakarta, September 7, 2012; Human Rights Watch interview with Steve Hamilton, deputy Chief of Mission, IOM Indonesia, Jakarta, September 12, 2012. Human Rights Watch interview with Ali H., Cisarua, September 9, 2012. Regional Support Office to The Bali Process, “Information Sheet: Mapping and Analyzing the Protection Situation of Unaccompanied and Separated Children in South East Asia,” 2012, on file with Human Rights Watch. Febionesta, “Indonesian Law and Refugee Protection,” presented at ASEAN Civil Society Conference in Jakarta on 3-5 May 2011, on file with Human Rights Watch (no migrants, whether children or not, are granted the right to access to legal counsel). Human Rights Watch group interview with Sayed M., [location withheld], September 4, 2012. General Comment No. 6, para. 21. Human Rights Watch interview with Enayet H., Medan, August 24, 2012.He said he was 11 years old when we spoke to him and may have turned 12 by now. Including direct interviews with children, interviews with adults who were children when they entered Indonesia, and interviews with parents of very young children. We sent letters requesting data and other information concerning immigration and detention in Indonesia, on December 21, 2012, and again on March 5, 2013, to the chief of national police, the minister of law and human rights, and the ambassadors to the US and to the UN in Geneva and in New York..
 Jessie Taylor, “Behind Australian Doors: Examining the Conditions of Detention of Asylum Seekers in Indonesia,” November 2009, http://www.law.monash.edu.au/castancentre/news/behind-australian-doors-report.pdf (accessed November 27, 2012), p. 12 (describing poorly transliterated and missing names in a record log at Jakarta’s central immigration office). Human Rights Watch interview with high-ranking police official, Tanjung Pinang City, September 12, 2012. Ministerial instructions in 2004 listed these detention facilities: Medan/Belawan (covering the provinces of Aceh and North Sumatra); Pekanbaru (covering Riau, Jambi, and West Sumatra); Batam/Tanjung Pinang (covering the Riau Islands); Jakarta/Kalideres (covering Jakarta, West Java, Banten, Lampung, South Sumatra, Bangka Belitung, and Bengkulu); Semarang (covering Central Java, Yogyakarta, and Central Kalimantan); Surabaya (covering East Java, South Kalimantan); Pontianak (covering West Kalimantan); Balikpapan (covering East Kalimantan); Manado (covering North Sulawesi, Central Sulawesi, and Gorontalo); Makassar (covering South Sulawesi, South East Sulawesi, North Maluku, and Maluku); Denpasar (covering Bali and West Nusa Tenggara); Kupang (covering East Nusa Tenggara) and Jayapura (covering Papua). Facilities listed at Direktorat Jenderal Imigrasi, “Rumah Detensi Imigrasi,” http://www.imigrasi.go.id/index.php/hubungi-kami/rumah-detensi-imigrasi (accessed February 25, 2013). Human Rights Watch interview with Yunus Junaid, director of Tanjung Pinang IDC, Tanjung Pinang, September 12, 2012. Human Rights Watch telephone interview with immigration security officer, Tanjung Pinang IDC, September 12, 2012. Human Rights Watch interview with Jairaj N., Medan, August 24, 2012. Human Rights Watch interview with Saasvikan P., Medan, August 24, 2012. Human Rights Watch group interview with Safia A., Medan, August 26, 2012. Human Rights Watch group interview with Miriam A., Medan, August 26, 2012. Human Rights Watch group interview with Raahitha H., [location withheld], September 12, 2012. Human Rights Watch group interview with Selva P., Cisarua, September 7, 2012. Human Rights Watch interview with Labaan A., Cisarua, September 7, 2012. UNHCR, Guidelines on the Applicable Criteria and Standards relating to the Detention of Asylum-Seekers and Alternatives to Detention (Geneva, 2012) (“UNHCR Guidelines”), http://www.unhcr.org/refworld/docid/503489533b8.html (accessed November 26, 2012), para. 48. Human Rights Watch interview with Faizullah A., Medan, August 25, 2012. Pursuant to article 113 of Law No. 6 issued in 2011 on immigration, the criminal penalty for illegal entry or illegal exit, is maximum 1 year of imprisonment and/or maximum 100 million rupiah (100 million Indonesia Rupiah, equivalent to US $10,315). (Setiap orang yang dengan sengaja masuk atau keluar Wilayah Indonesia yang tidak melalui pemeriksaan oleh Pejabat Imigrasi di Tempat Pemeriksaan Imigrasi sebagaimana dimaksud dalam Pasal 9 ayat (1) dipidana dengan pidana penjara paling lama 1 (satu) tahun dan/atau pidana denda paling banyak Rp100.000.000,00 (seratus juta rupiah)). ICCPR, art. 9; Standard Minimum Rules, art. 7; Body of Principles, princ. 32. Human Rights Watch interview with IOM staffer, Pontianak, September 5, 2012. Report of the Working Group on Arbitrary Detention, Annex III, para. 8(d), January 17, 2011, http://www2.ohchr.org/english/bodies/hrcouncil/docs/16session/A-HRC-16-47.pdf, (accessed May 9, 2012). UNHCR, Guidelines on the Applicable Criteria and Standards relating to the Detention of Asylum-Seekers and Alternatives to Detention (Geneva, 2012) (“UNHCR Guidelines”), http://www.unhcr.org/refworld/docid/503489533b8.html (accessed November 26, 2012), Guidelines 2 and 3. UN Committee on the Rights of the Child, “Report of the 2012 Day of General Discussion on the Rights of All Children in the Context of International Migration,” February 2013, http://www2.ohchr.org/english/bodies/crc/docs/discussion2012/2012CRC_DGD-Childrens_Rights_InternationalMigration.pdf (accessed March 21, 2013), para. 78. Matt Brown, “Asylum Seeker Beaten to Death in Detention,” ABC News, March 1, 2012, http://www.abc.net.au/lateline/content/2012/s3443826.htm (accessed April 21, 2013) (referring to instances of two men allegedly beaten at Surabaya IDC in late February 2012). “Ruthless torturing of asylum seekers continues,” Hazara Asylum Seekers, July 19, 2012, http://hazaraasylumseekers.wordpress.com/2012/07/19/ruthless-torturing-of-asylum-seekers-continues-in-indonesia-by-indonesian-torturation-police-and-immigration-authorities-with-impunity/ (accessed April 21, 2013). “Buddhist, Muslims from Myanmar clash in Indonesia,” Miami Herald, April 4, 2013, http://www.miamiherald.com/2013/04/04/3324442/buddhist-muslims-from-myanmar.html#storylink=cpy (accessed April 21, 2013). ICCPR art. 3; Standard Minimum Rules, art. 31. UNHCR, “UNHCR deplores the death of an asylum seeker in Pontianak, Indonesia,” March 2, 2012, http://www.unhcr.org/4f509c726.html (accessed November 27, 2012). Matt Brown, “Asylum Seeker Beaten to Death in Detention,” ABC News, March 1, 2012, http://www.abc.net.au/news/2012-03-01/asylum-seeker-beaten-to-death-in-detention/3863582 (accessed November 27, 2012). Matt Brown, “Asylum seekers allegedly abused in Indonesia,” Australian Broadcasting Corporation, March 3, 2012, http://www.abc.net.au/lateline/content/2012/s3449246.htm (accessed November 27, 2012). “Afghan Asylum Seeker Allegedly Beaten to Death in Indonesia Detention Center,” Jakarta Globe, March 2, 2012, http://www.thejakartaglobe.com/news/afghan-asylum-seeker-allegedly-beaten-to-death-in-indonesia-detention-center/502002 (accessed November 27, 2012). Human Rights Watch interview with C.A., psychologist, Pontianak, September 5, 2012. Human Rights Watch interview with Rudy Prasetyo, immigration officer, Pontianak IDC, September 4, 2012. “49 Pegawai Imigrasi Terkena Sanksi Disiplin di 2012,” Harian Pelita, December 27, 2012, http://harian-pelita.pelitaonline.com/cetak/2012/12/27/49-pegawai-imigrasi-terkena-sanksi-disiplin-di-2012#.USwlUY42GrV (accessed April 25, 2013). Pseudonym. Human Rights Watch did not interview Mirza. Psychological records for Mirza provided by C.A. and on file with Human Rights Watch. Human Rights Watch interview with Daoud T., Medan, August 25, 2012. Human Rights Watch interview with Kannan A., Belawan IDC, September 12, 2012. Pseudonym. Human Rights Watch did not interview Sadiq. Human Rights Watch interview with Mohammad S., Medan, August 26, 2012. United Nations Rules for the Protection of Juveniles Deprived of their Liberty (Rules for the Protection of Juveniles), adopted December 14, 1990, G.A. Res. 45/113, annex, 45 U.N. GAOR Supp. (No. 49A) at 205, U.N. Doc. A/45/49 (1990), art. 63. Human Rights Watch interview with Sher K., Medan, August 25, 2012. Human Rights Watch interview with Nuwan D., Medan, August 23, 2012. Human Rights Watch interview with Ravith N., Medan, August 23, 2012. The interviewee drew a picture that resembled an electroshock weapon. Human Rights Watch interview with Khalid A., Medan, August 25, 2012. Human Rights Watch interview with Enayet H., Medan, August 24, 2012. Human Rights Watch group interview with Nasir and Safia A., Medan, August 26, 2012. We sent letters requesting data and other information concerning immigration and detention in Indonesia, on December 21, 2012 and again on March 5, 2013, to the Chief of National Police, the Minister of Law and Human Rights, and the Ambassadors to the US and to the UN in Geneva and in New York. Email to Human Rights Watch from NGO staff member, February 25, 2013. Human Rights Watch group interview with Nazar M., Pontianak IDC, September 4, 2012. Human Rights Watch group interview with Zabiullah B., September 4, 2012. United Nations Rules for the Protection of Juveniles Deprived of their Liberty (Rules for the Protection of Juveniles), adopted December 14, 1990, G.A. Res. 45/113, annex, 45 U.N. GAOR Supp. (No. 49A) at 205, U.N. Doc. A/45/49 (1990), art. 11. United Nations Standard Minimum Rules for the Treatment of Prisoners (Standard Minimum Rules), adopted by the First United Nations Congress on the Prevention of Crime and the Treatment of Offenders, held at Geneva in 1955, and approved by the Economic and Social Council by its resolution 663C (XXIV) of July 31, 1957, and 2076 (LXII) of May 13, 1977, art. 8(d); ICCPR art. 2(b). Human Rights Watch interview with Shakairan A., Medan, August 23, 2012. Human Rights Watch interview with Udaya V., Medan, August 23, 2012. CRC, art. 37(c), ICCPR, art. 10(b). The CRC only allows the joint detention of children and adults if it is in the child’s best interest. Ibid. “Special arrangements must be made for living quarters that are appropriate for children and that separate them from adults[. ]” UN Committee on the Rights of the Child, General Comment No. 6, para. 63. Though immigration authorities failed to provide education, some migrants organized classes for children. Enayet H., a Burmese Rohingya boy, who was 9 years old when he was detained, said, “In the jail, there was no school. People teach English … They are Afghan.” (Human Rights Watch interview with Enayet H., Medan, August 24, 2012.) Saasvikan P., an 11-year-old Sri Lankan boy detained at Tanjung Pinang IDC for eleven months, told us, “My mother acted as teacher for all of the children under 15.” (Human Rights Watch interview with Saasvikan P., Medan, August 24, 2012). General Comment No. 6, para. 63. Rules for the Protection of Juveniles, arts. 38 and 39. Human Rights Watch interview with Balanandini N., Medan, August 24, 2012. Human Rights Watch interview with Steve Hamilton, deputy chief of mission, IOM Indonesia, Jakarta, September 12, 2012. Standard Minimum Rules, art. 21. Human Rights Watch interview with Thivviya N., Medan, August 24, 2012. Human Rights Watch interview with Delani K., Medan, August 24, 2012. Dr. Allan S. Keller et al, “Mental health of detained asylum seekers,” The Lancet, vol. 362, issue 9397 (November 22, 2003), pp. 1721-1723. Human Rights Watch interview with Mohammed A., Pontianak IDC, September 4, 2012. Karen McVeigh, “Children made ‘sick with fear’ in UK immigration detention centres: Weight loss, difficulty sleeping, bed-wetting and sickness among symptoms found at Yarl’s Wood,” Guardian, October 13, 2009.
 International Detention Coalition, Captured Childhood: Introducing a New Model to Ensure the Rights and Liberty of Refugee, Asylum Seeker and Irregular Migrant Children Affected by Immigration Detention (Melbourne, 2012), pp. 48-49. Human Rights Watch interview with IOM doctor, Pontianak, September 5, 2012. Human Rights Watch interview with C.A., psychologist, Pontianak, September 5, 2012; psychological records for six unaccompanied migrant children provided by C.A. and on file with Human Rights Watch. Standard Minimum Rules, art. 44(3). Body of Principles, princ. 15. Standard Minimum Rules, preliminary observation 4 (“Part I of the rules … is applicable to all categories of prisoners, criminal or civil[. ]”); UNHCR Guidelines, para. 48. Human Rights Watch interview with Herdaus, director of Belawan IDC, September 12, 2012. “Buddhist, Muslims from Myanmar clash in Indonesia,” The Miami Herald, April 4, 2013, http://www.miamiherald.com/2013/04/04/3324442/buddhist-muslims-from-myanmar.html#storylink=cpy (accessed April 21, 2013). Human Rights Watch interview with immigration official, Bali IDC, Denpasar, September 3, 2012. Human Rights Watch group interview with Nasir A. and family, Medan, August 25, 2012. In 2010 in Jakarta, Sher K. was “put in a cell fit for eight men—but we were sixteen men.” Human Rights Watch interview with Sher K., Medan, August 25, 2012. Khalid was held at the Polonia immigration office in December 2011: “It was a very small room, just for five people, but sometimes ten of us were inside.” Human Rights Watch interview with Khalid A., Medan, August 25, 2012. Standard Minimum Rules, art. 19 (“[e]very prisoner shall … be provided with a separate bed, and with separate and sufficient bedding which shall be clean when issued[.]”). Human Rights Watch group interview, Belawan IDC, September 12, 2012. Human Rights Watch group interview with Raahitha H., Belawan IDC, September 12, 2012. Human Rights Watch interview with Mustafa A., Yogyakarta, September 7, 2012. Human Rights Watch group interview with Hariya P., Belawan IDC, September 12, 2012. Human Rights Watch group interview with Hussein A., [location withheld], September 12, 2012. Standard Minimum Rules, art. 43. Human Rights Watch interview with professional who works with refugees, September 7, 2012. Human Rights Watch group interview with Nabi B., [location withheld], September 4, 2012. Human Rights Watch interview with Baqir N., Pontianak IDC, September 4, 2012. Human Rights Watch group interview with Kiriti T., Medan, August 26, 2012. Human Rights Watch interview with Shajunan P., Medan, August 23, 2012. Human Rights Watch interview with Kiriya J., Medan, August 24, 2012. Human Rights Watch interview with staff member of NGO, Bogor, August 30, 2012. Convention relating to the Status of Refugees (1951 Refugee Convention), 189 UNTS 150, entered into force April 22, 1954, http://www.unhcr.org/refworld/docid/3be01b964.html (accessed April 23, 2013), art. 26. Human Rights Watch interview with Ravith N., Yogyakarta, September 18, 2012. Human Rights Watch group interview with Mirza S., Medan, September 13, 2012. Human Rights Watch interview with NGO staffer [who chose to remain anonymous to protect access to clients], Yogyakarta, September 18, 2012. “Major asylum boat tragedies in last decade,” Al Jazeera, August 31, 2012, http://www.aljazeera.com/news/asia-pacific/2012/08/201283017524760561.html (accessed June 10, 2013).